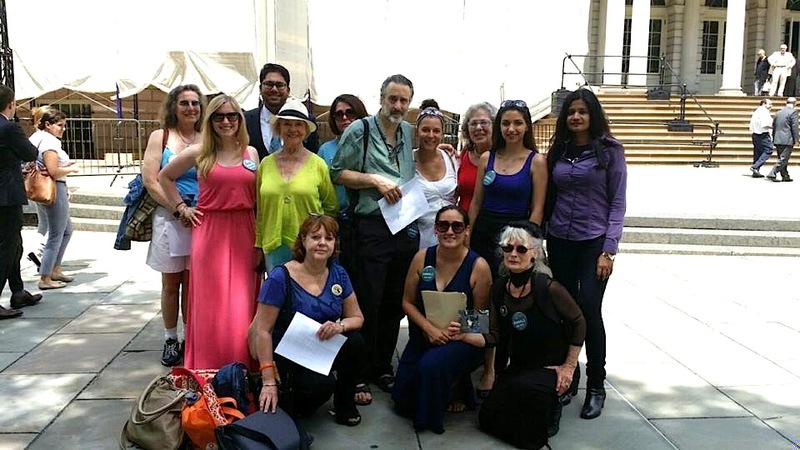 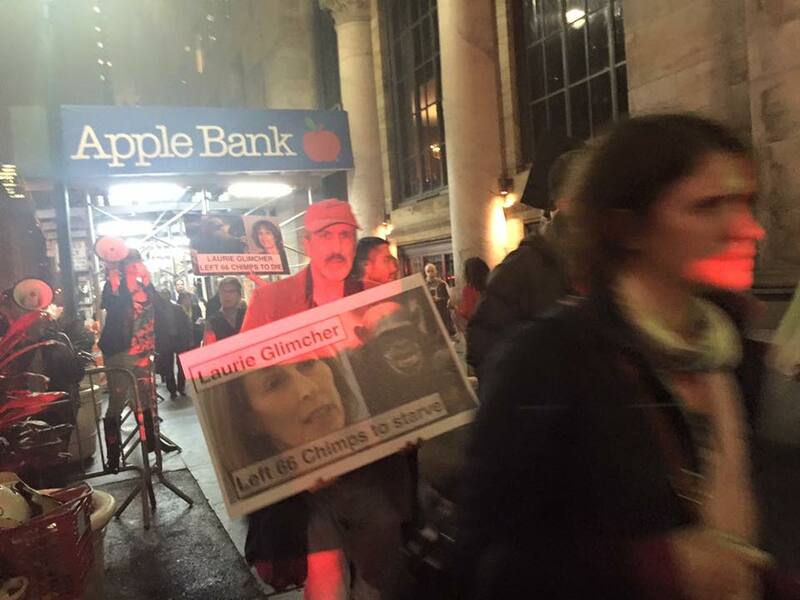 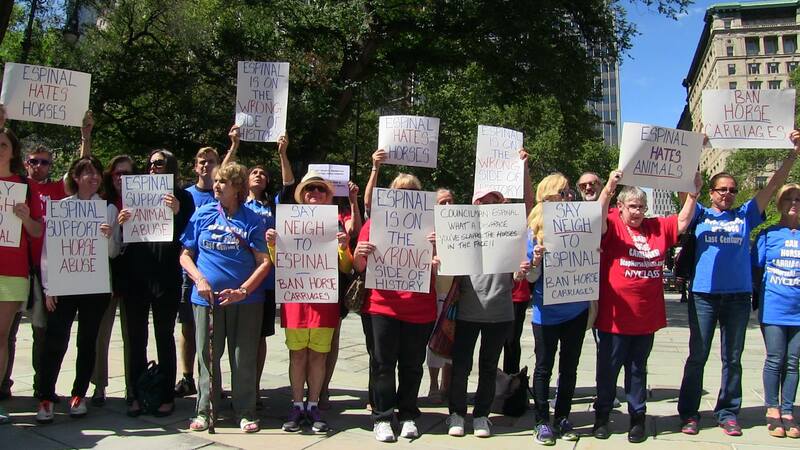 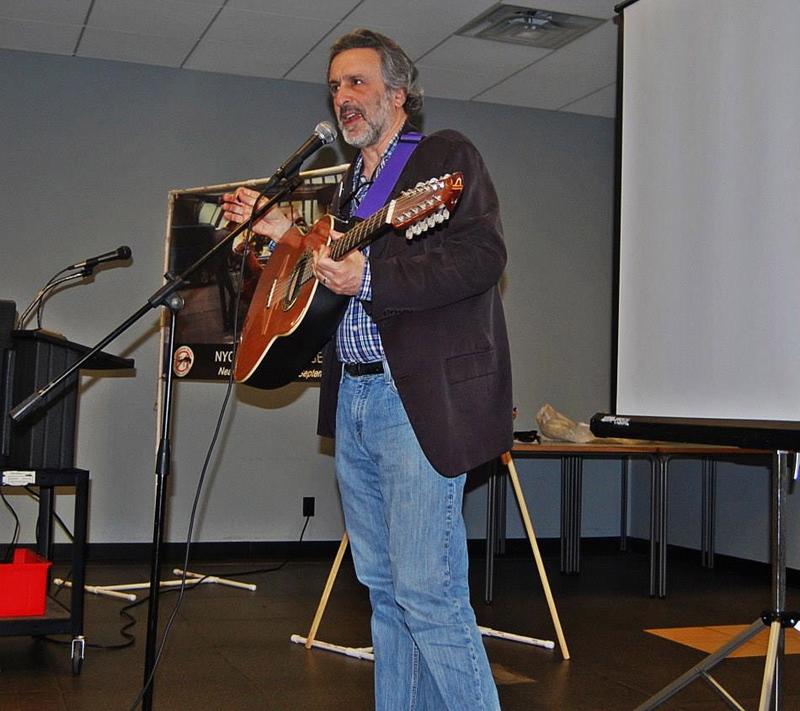 Click to see video from 10/7/15: Tensions are mounting in the campaign to hold Laurie Glimcher accountable. 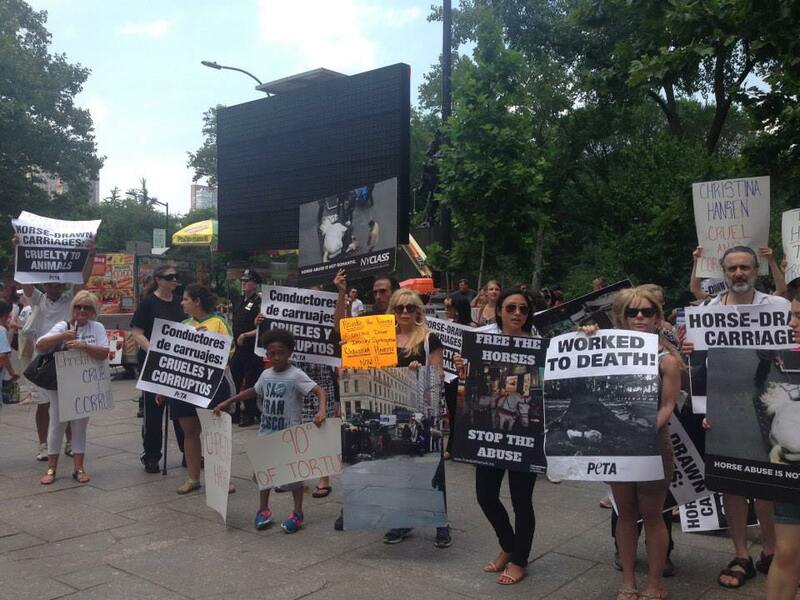 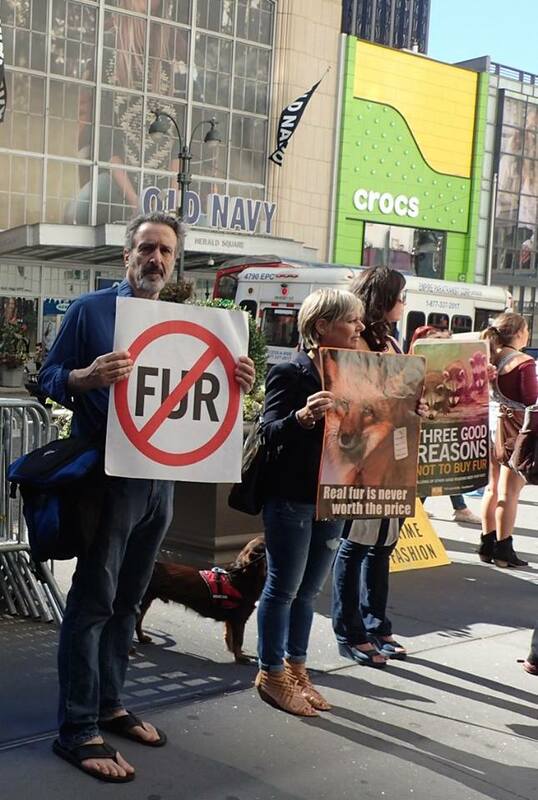 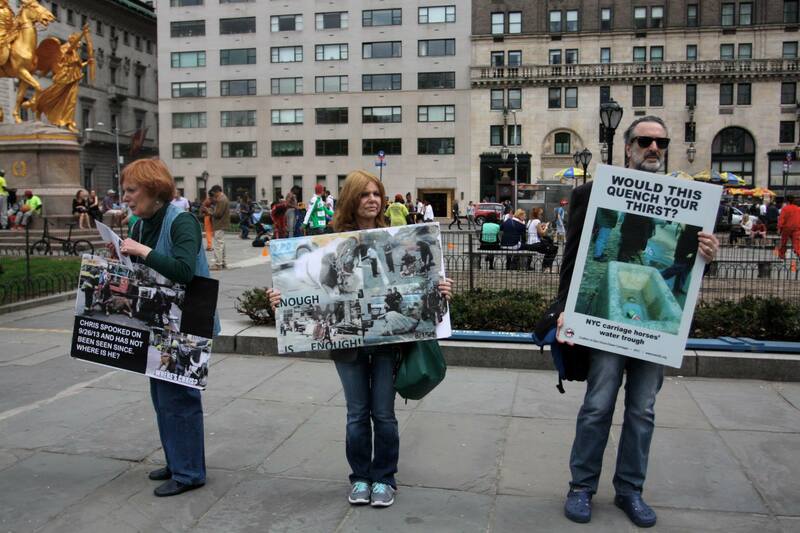 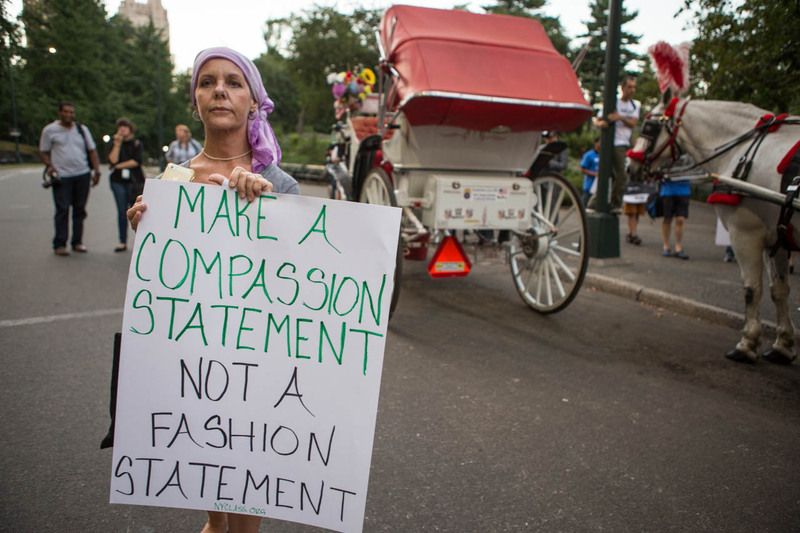 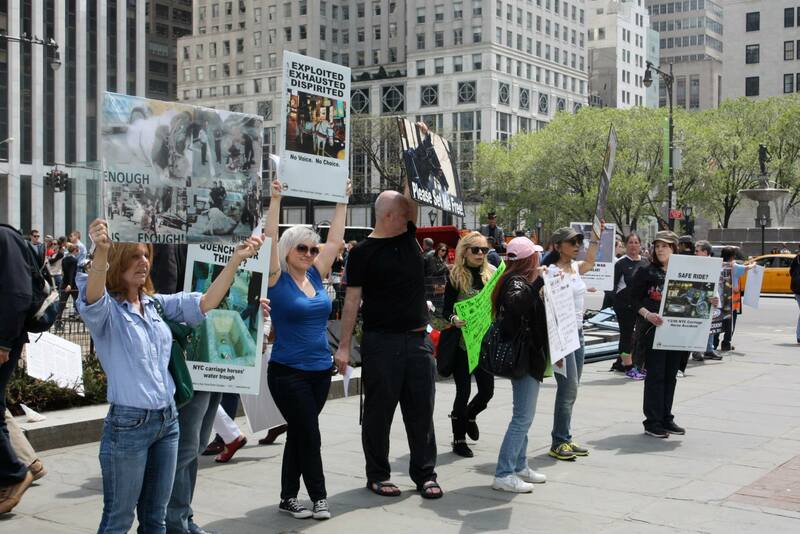 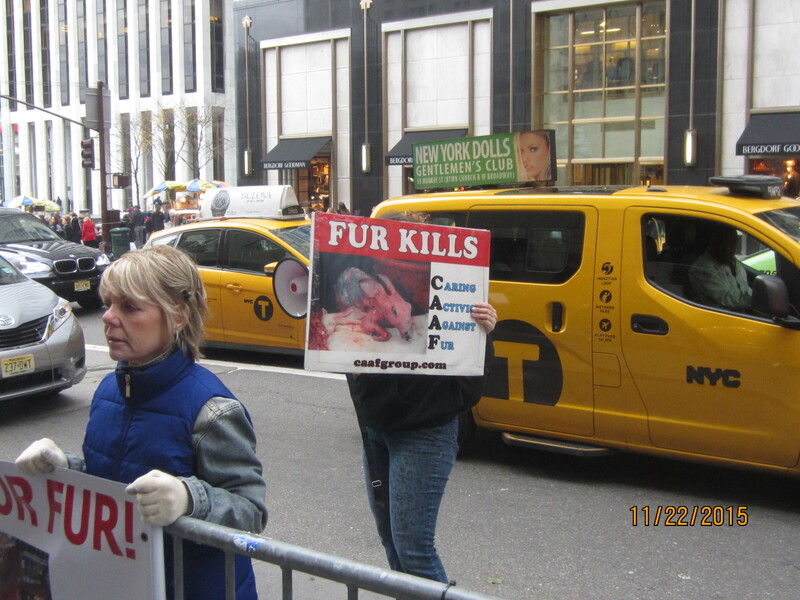 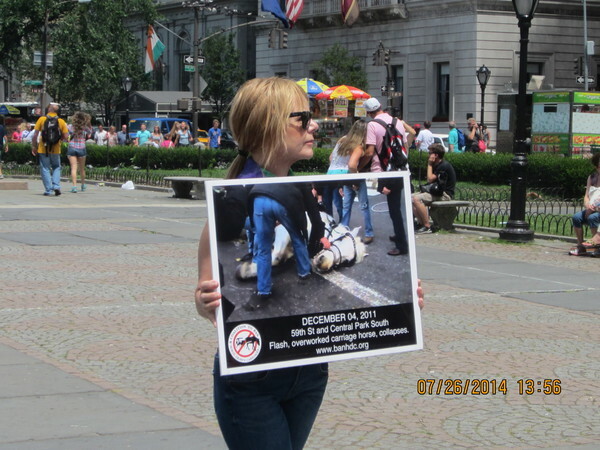 Anti-fur protest at Macy's 10/12/15. 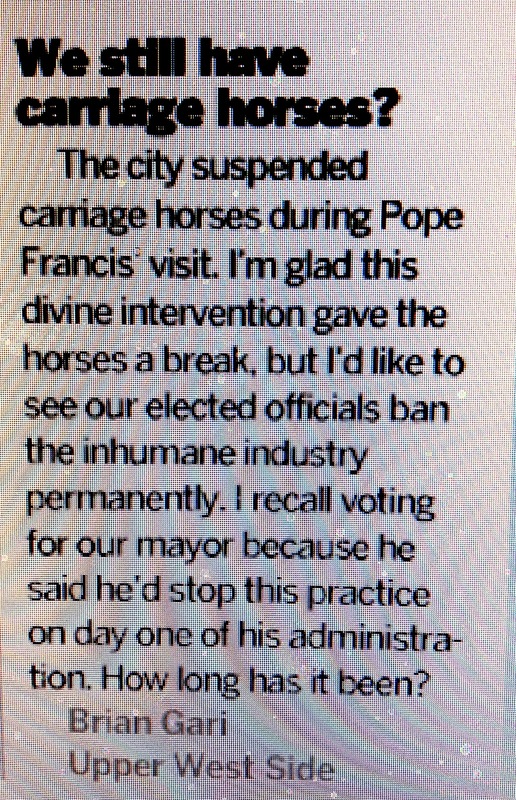 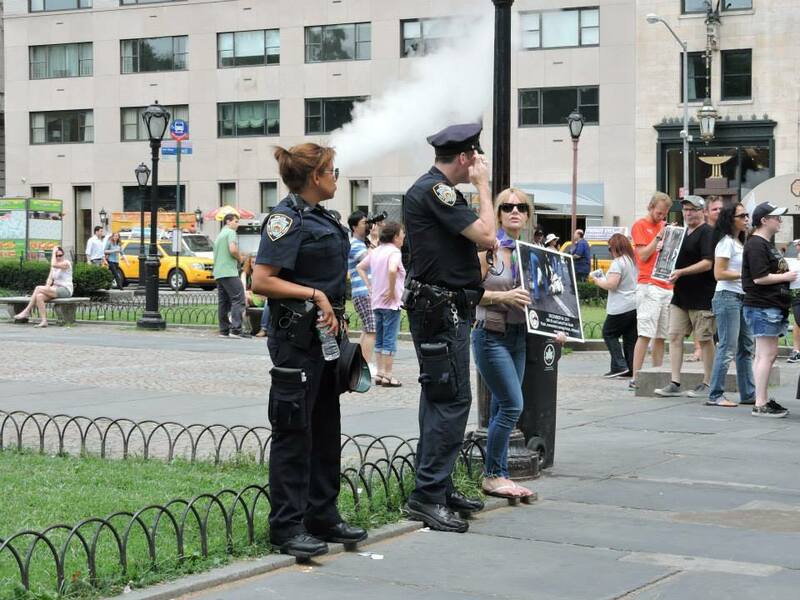 a letter printed in AM/NY 10/14/15. 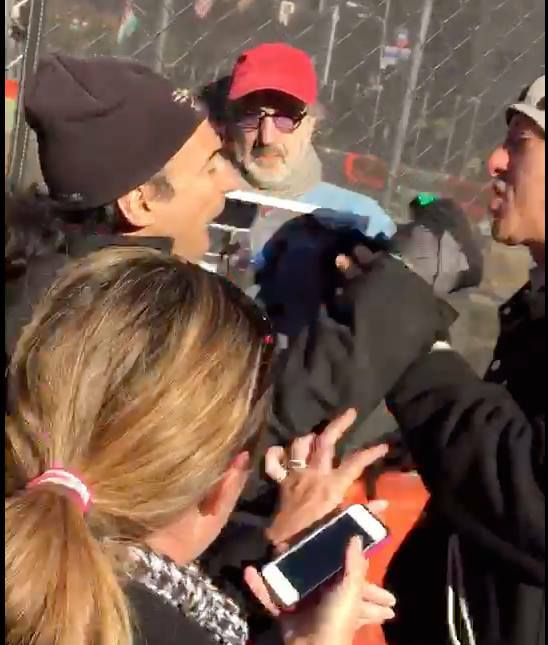 Click to see video from 10/20/15: Chaos unfolds when activists push back against Cornell security guards who try to stop a legal protest against the Dean of its medical school, Laurie Glimcher. 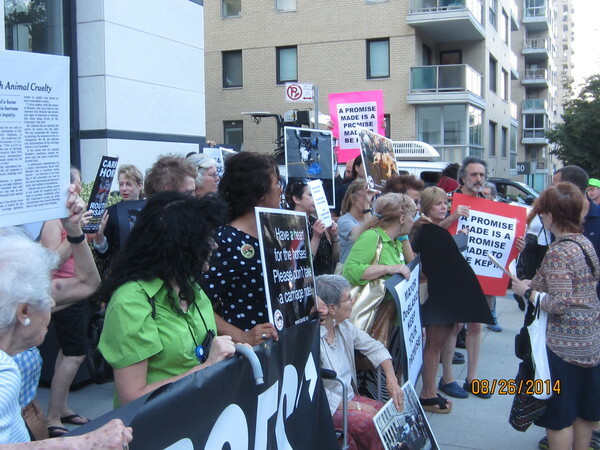 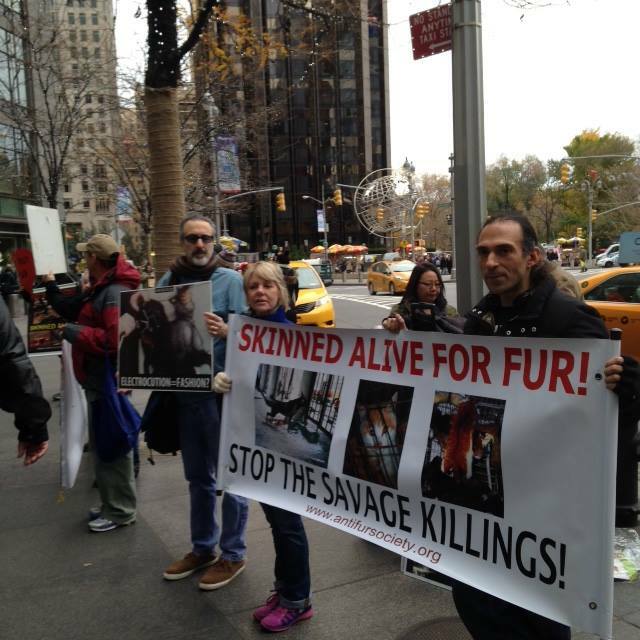 Anti-fur protest at Bloomingdale's 10/24/15. 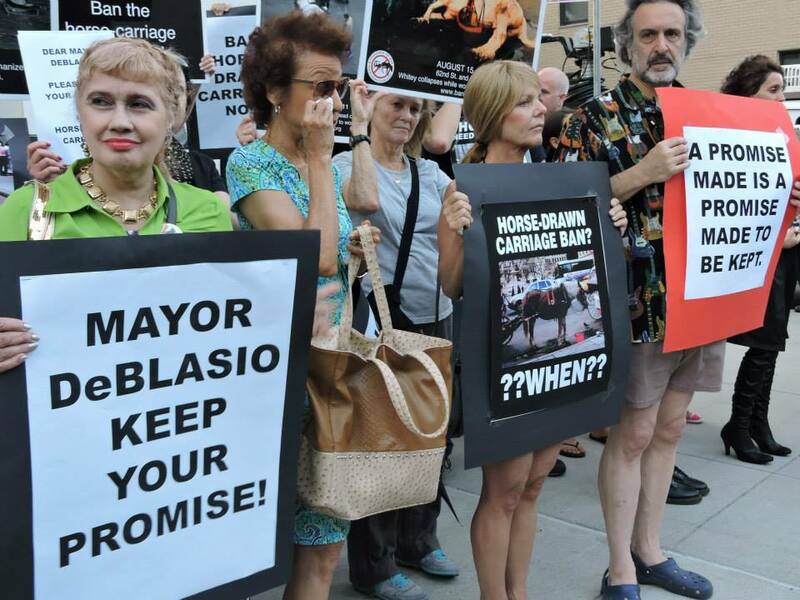 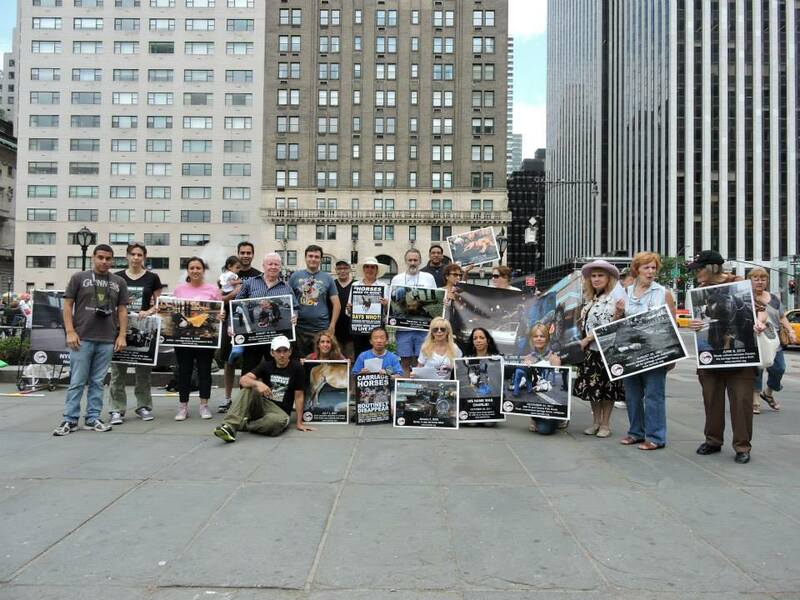 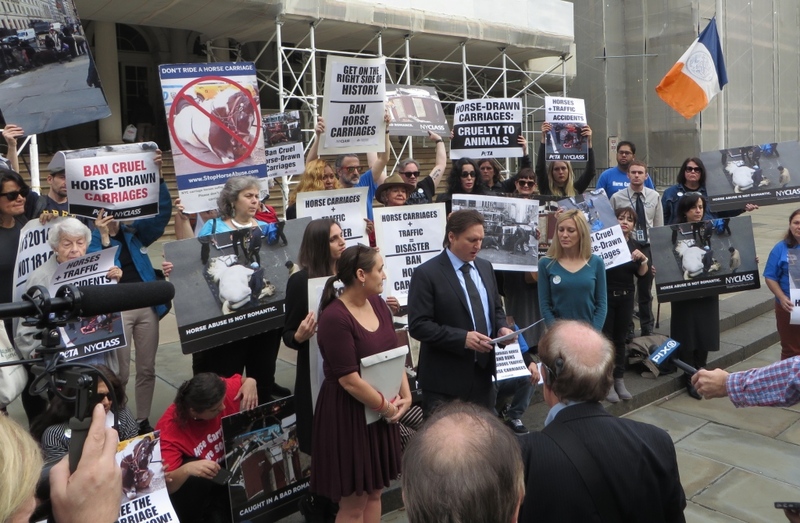 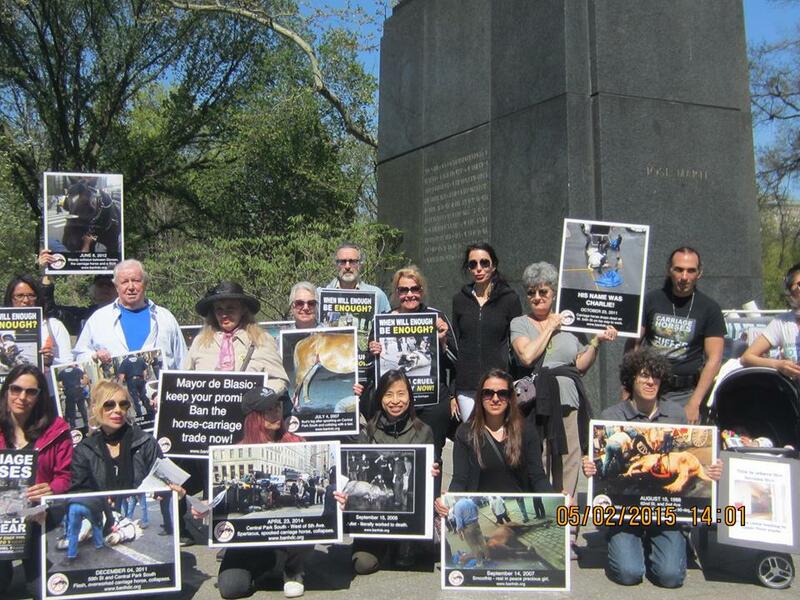 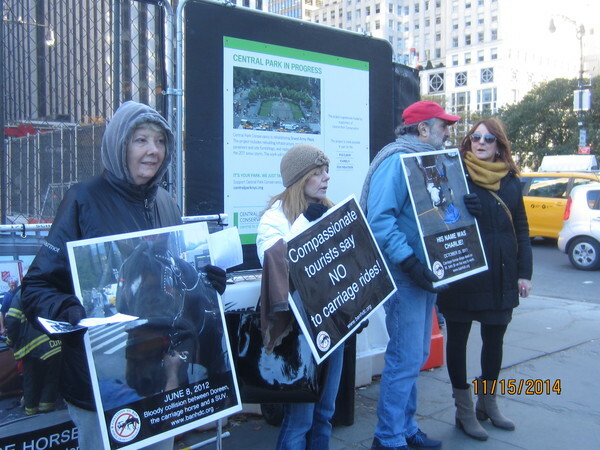 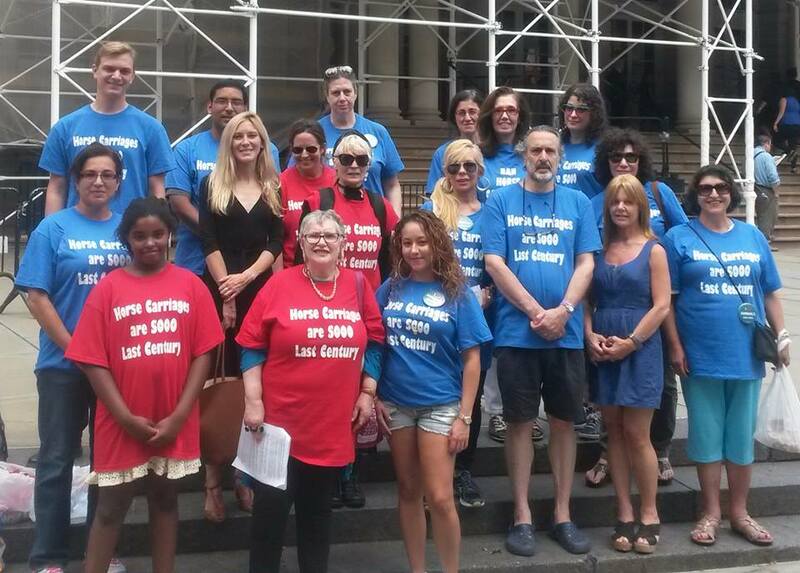 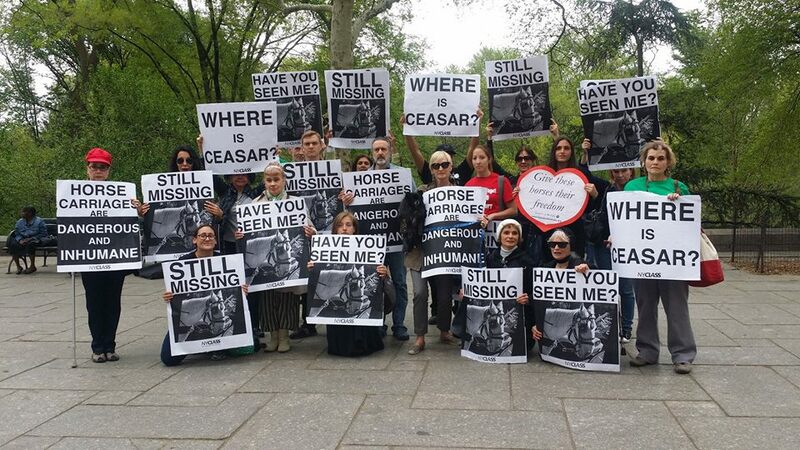 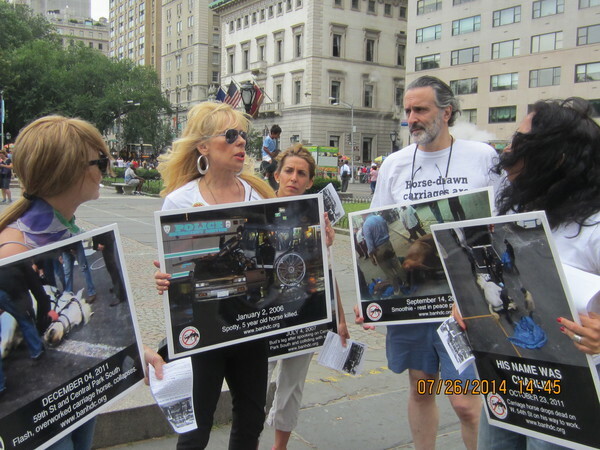 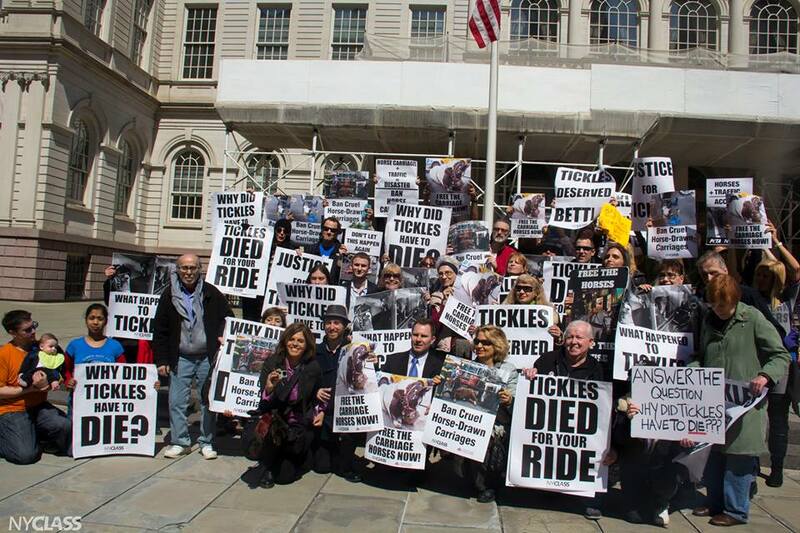 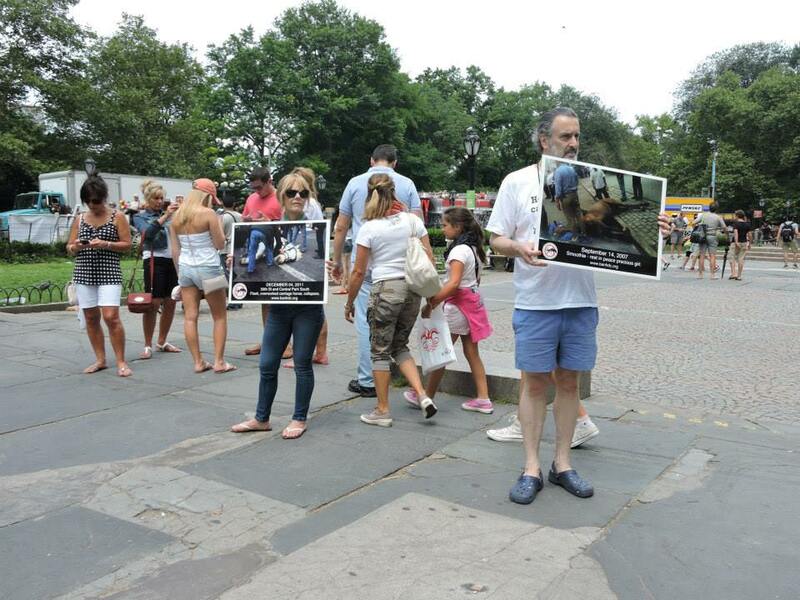 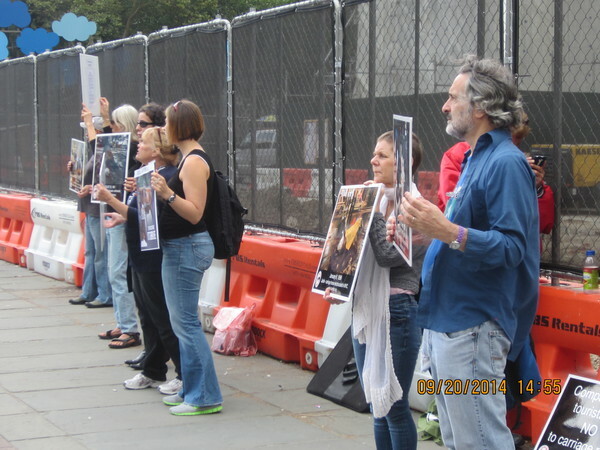 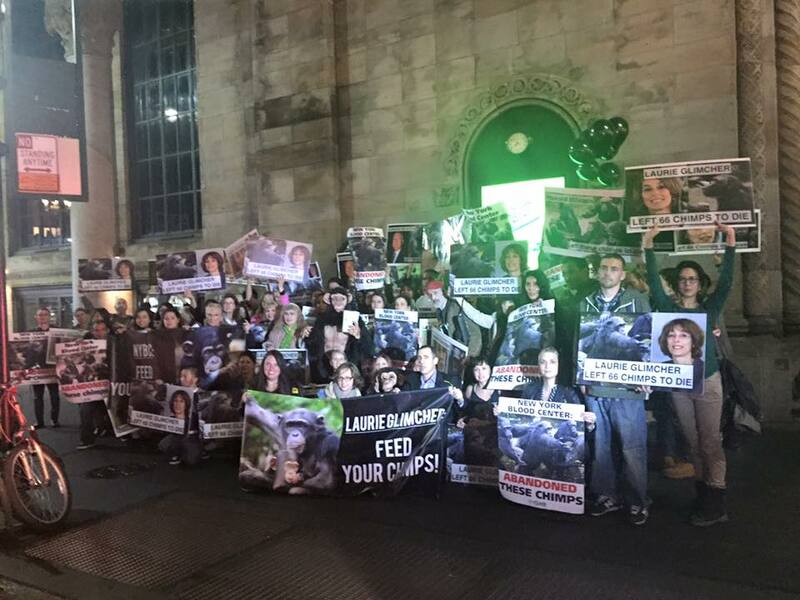 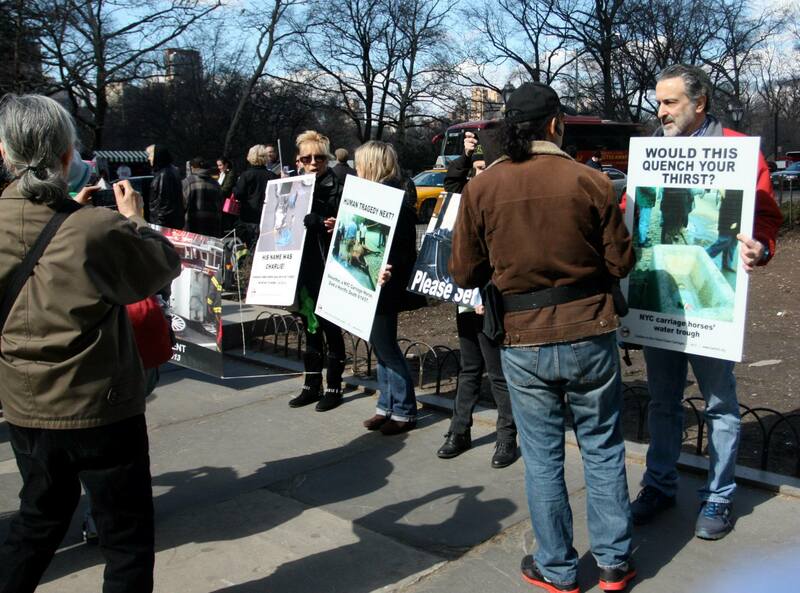 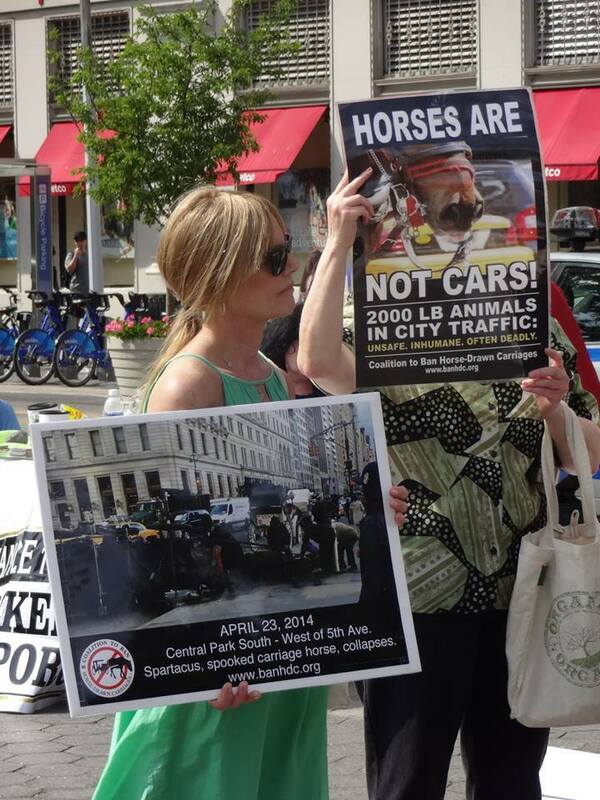 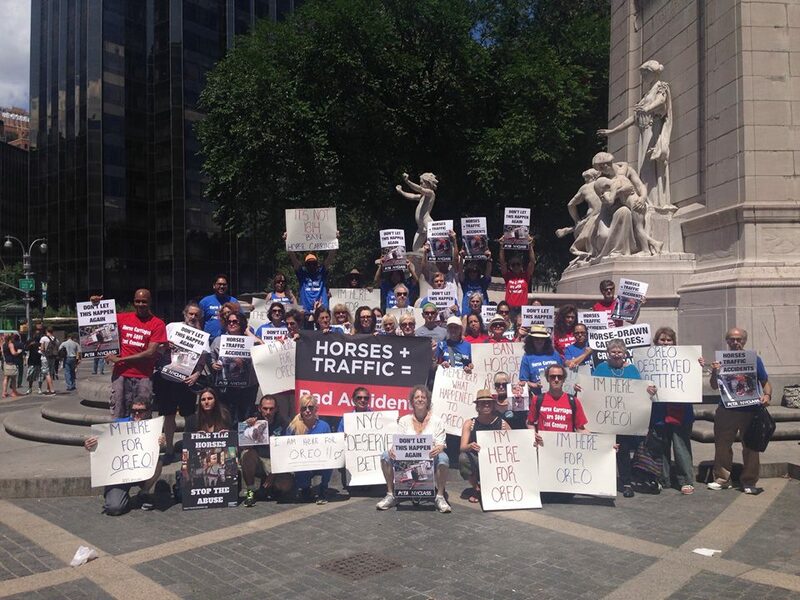 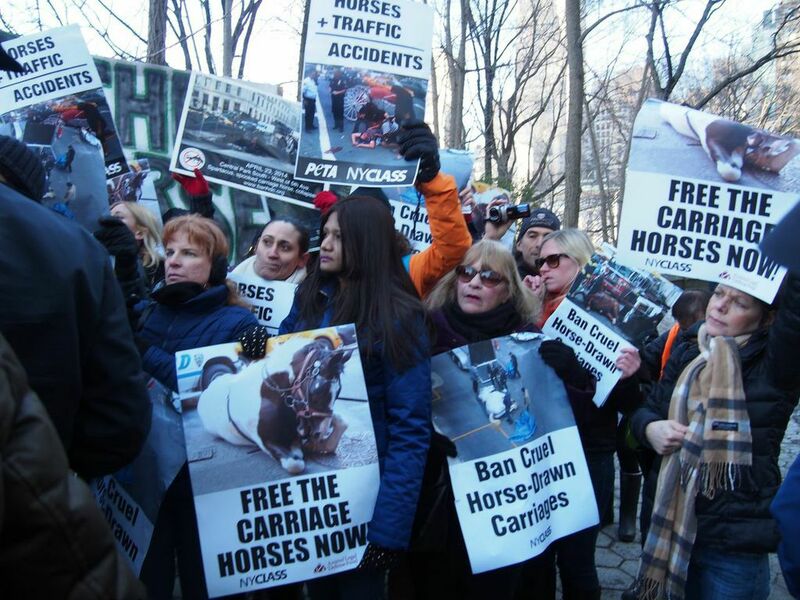 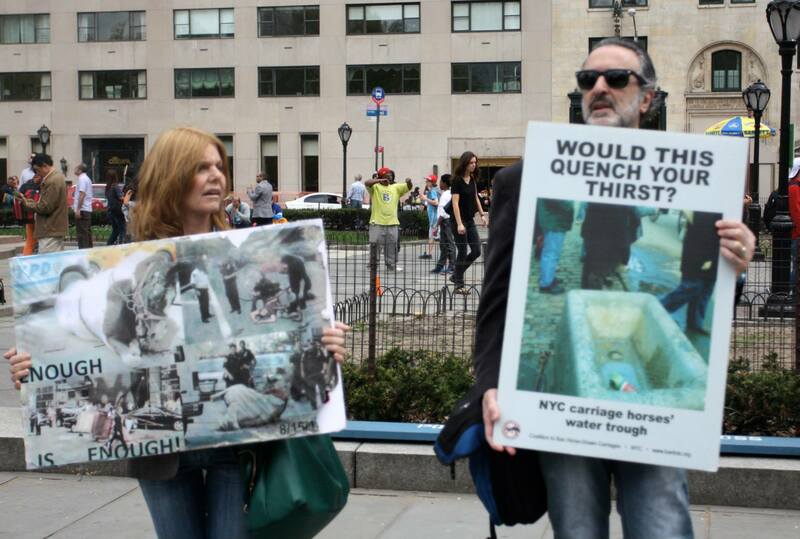 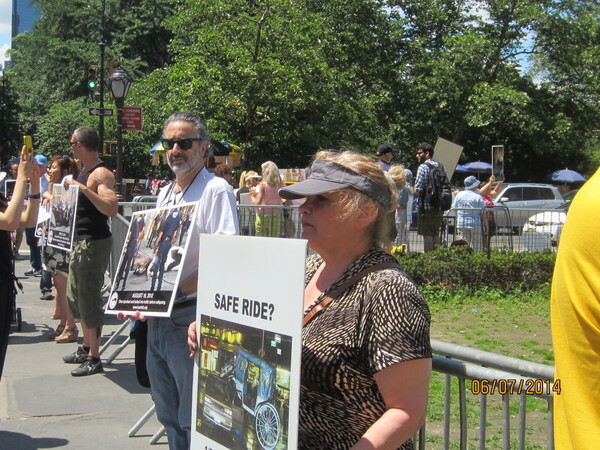 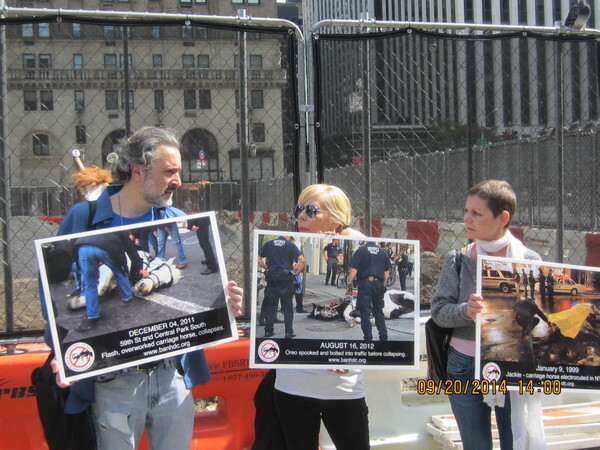 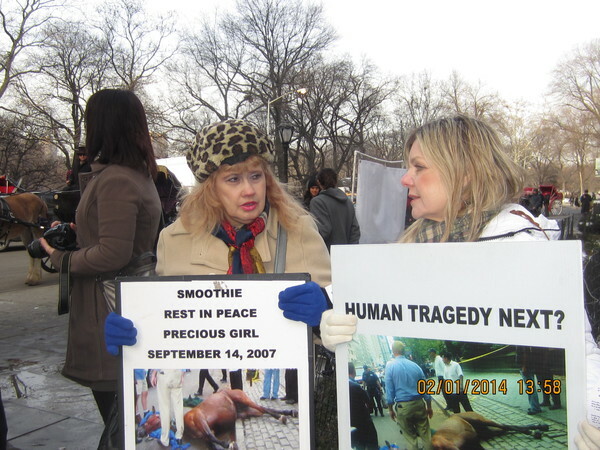 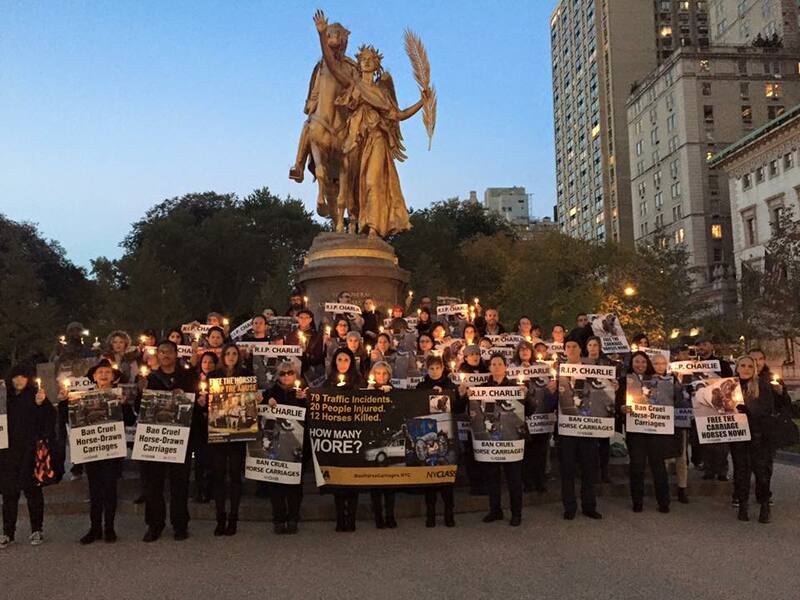 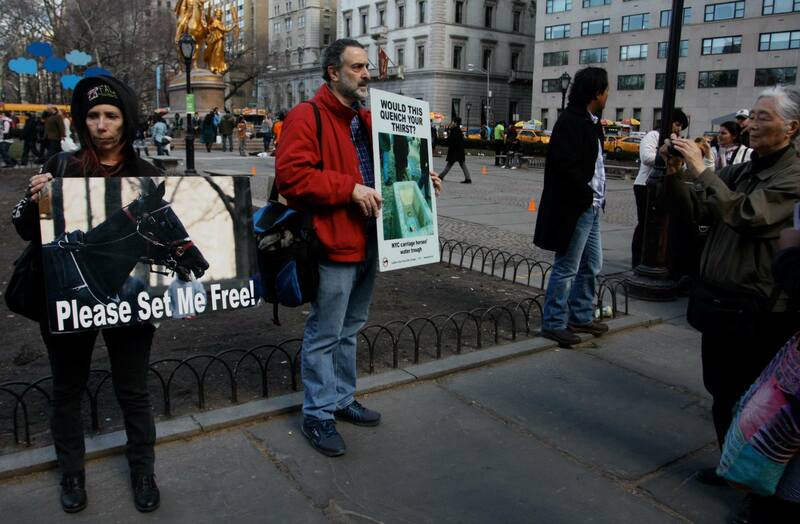 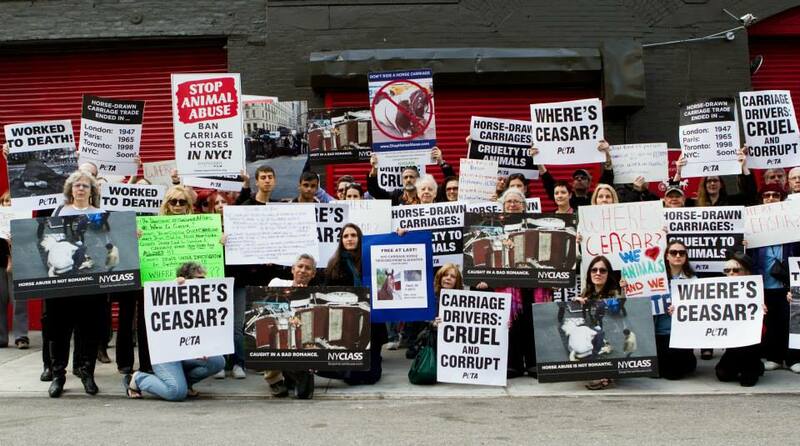 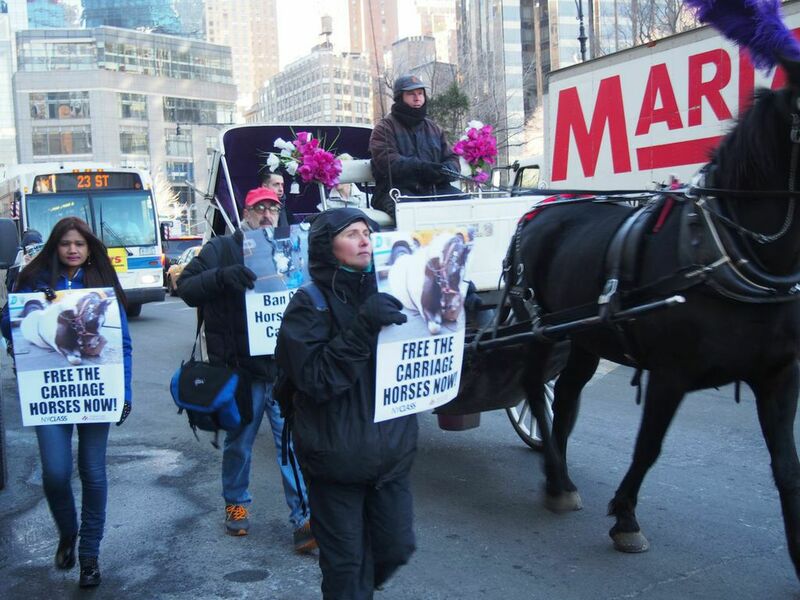 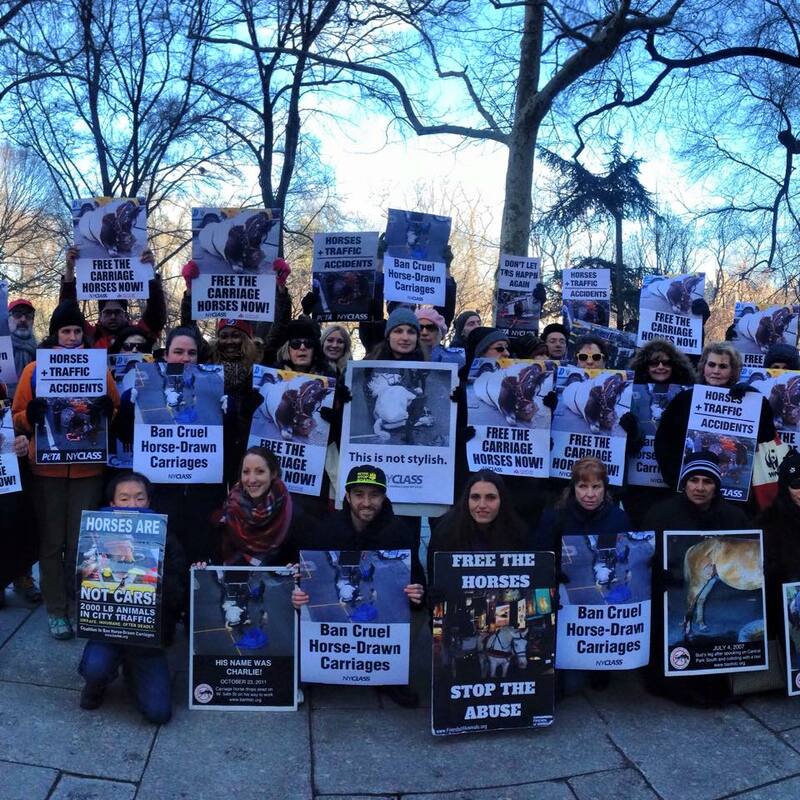 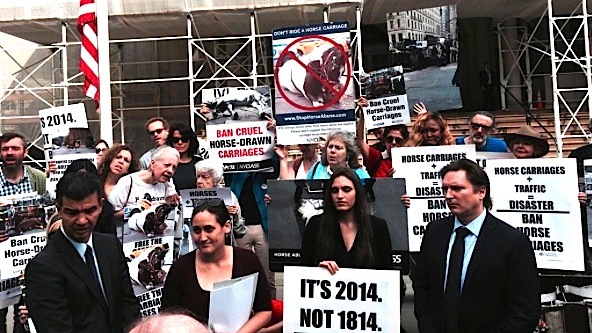 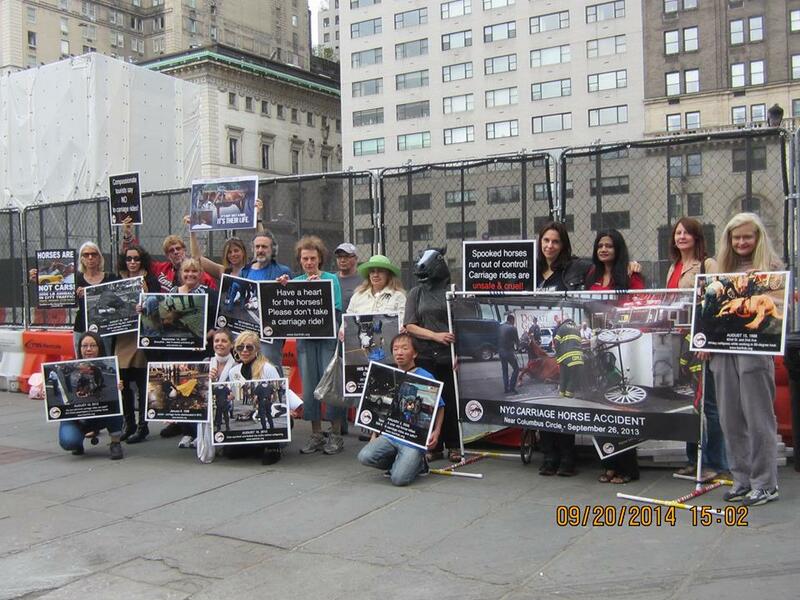 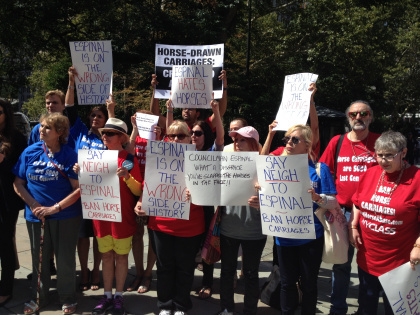 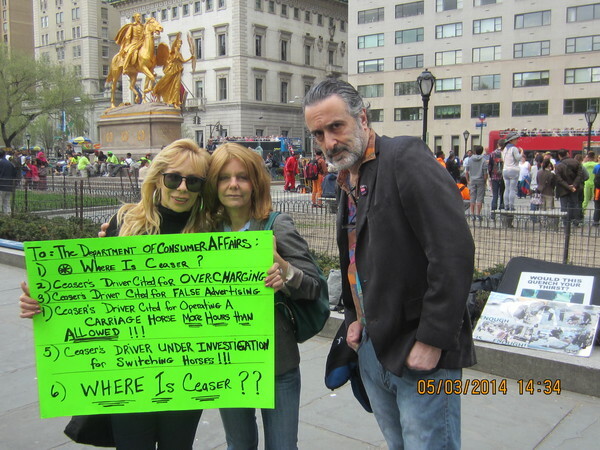 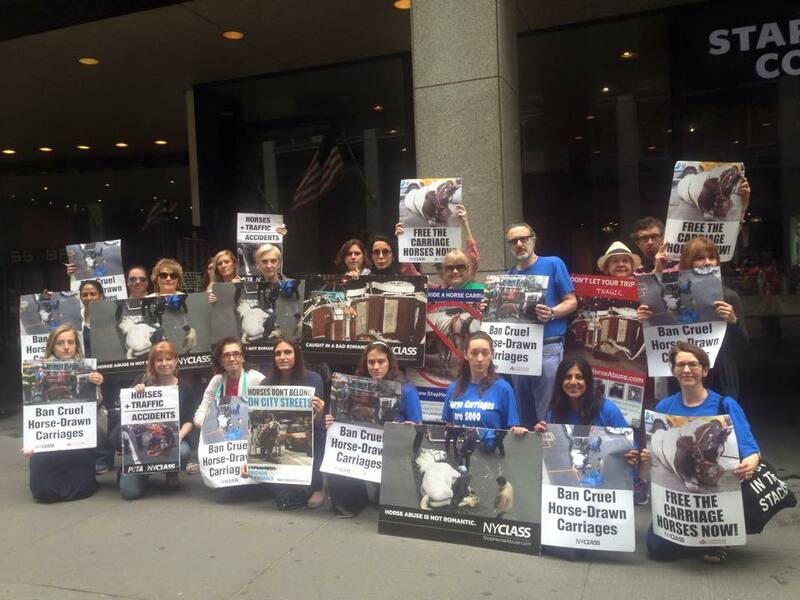 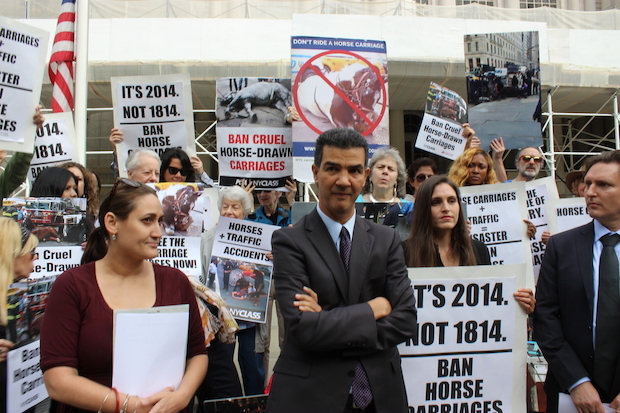 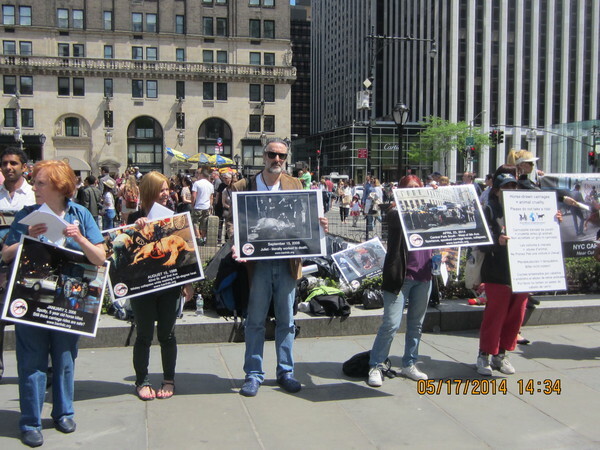 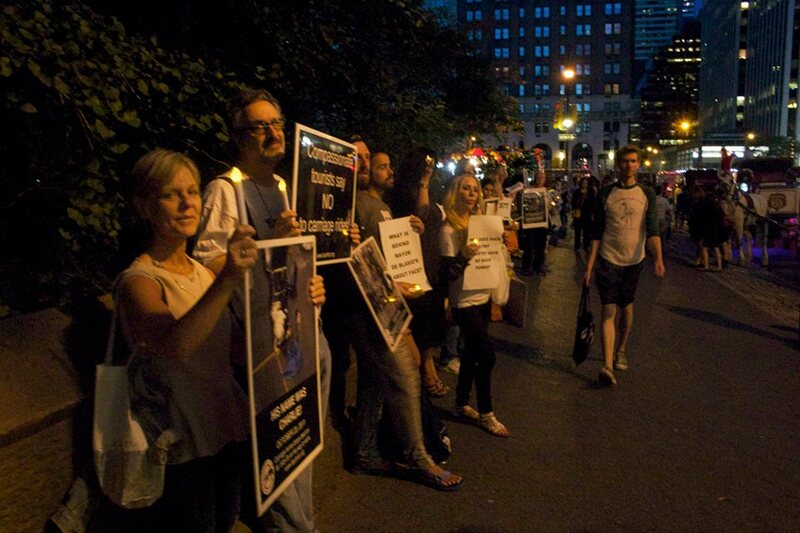 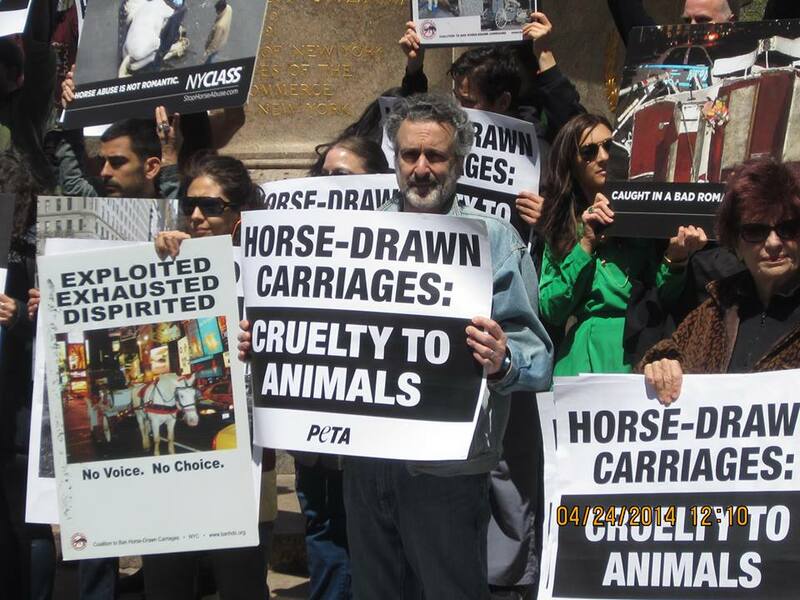 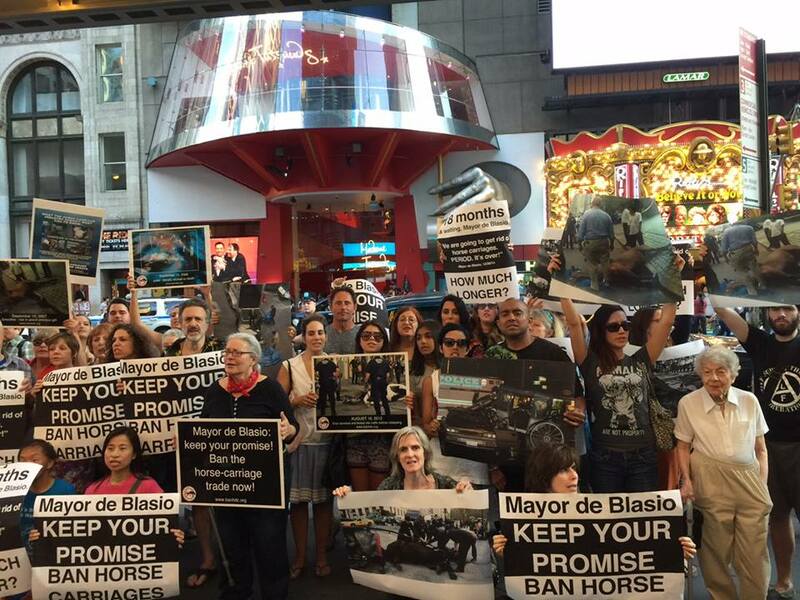 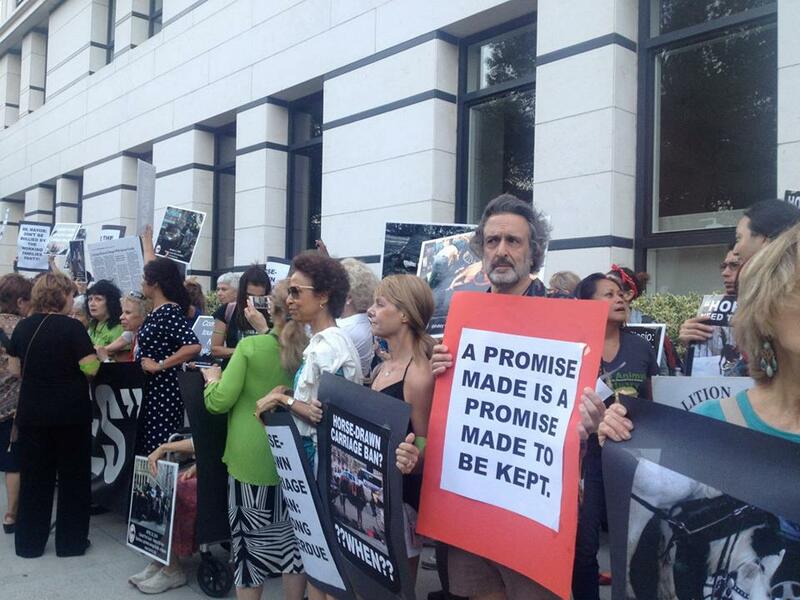 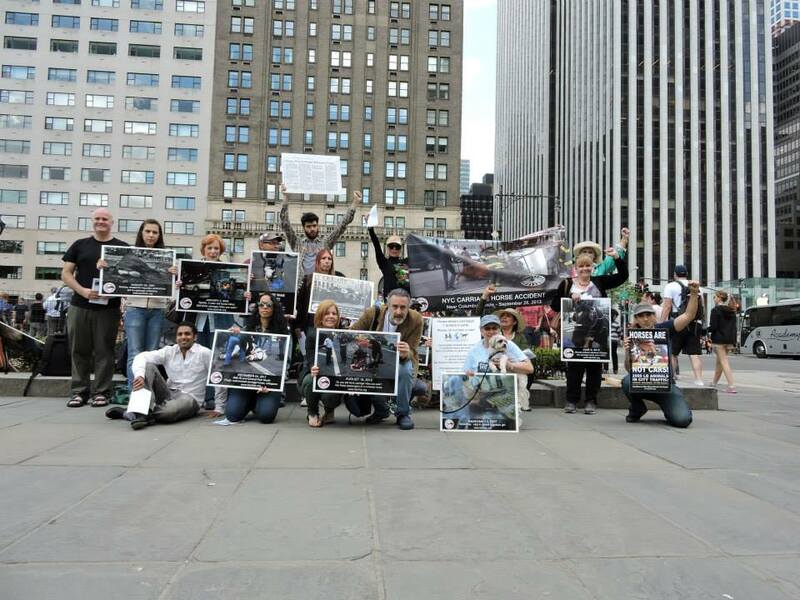 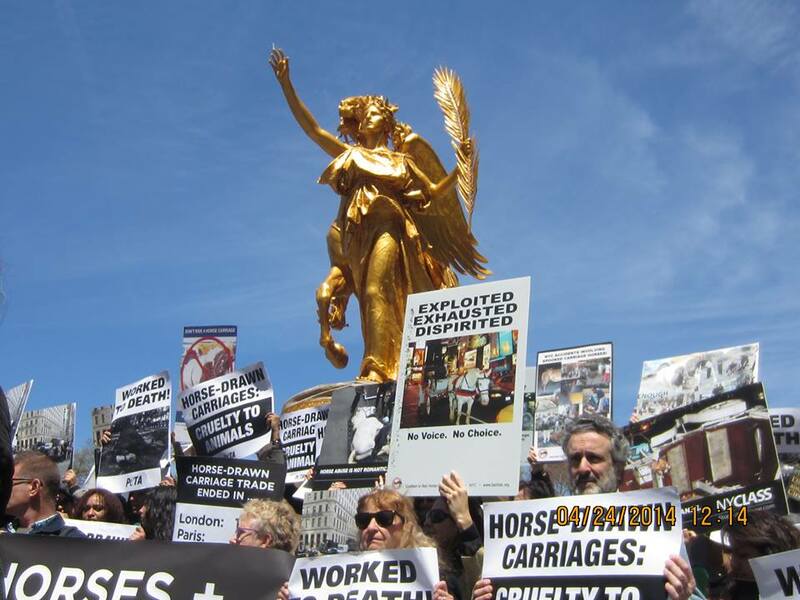 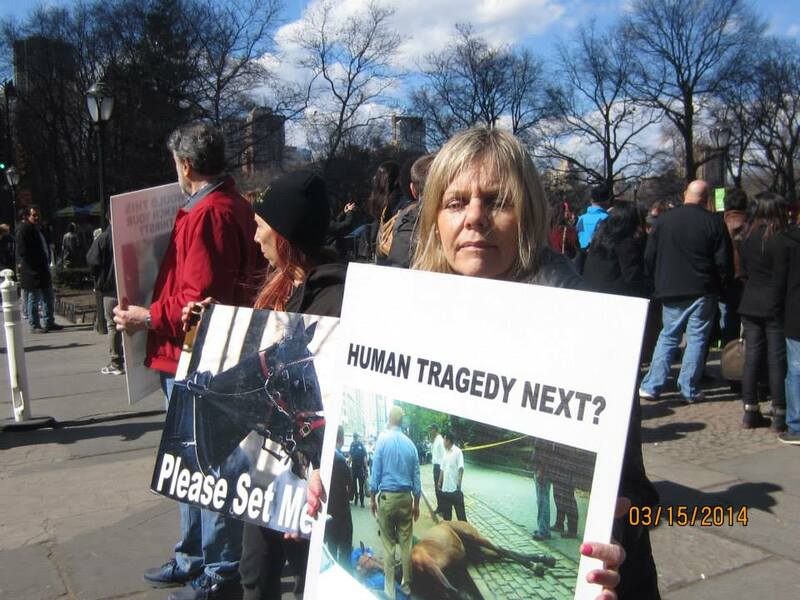 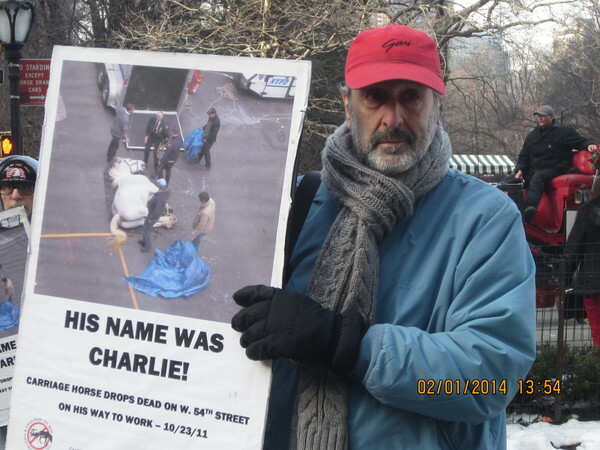 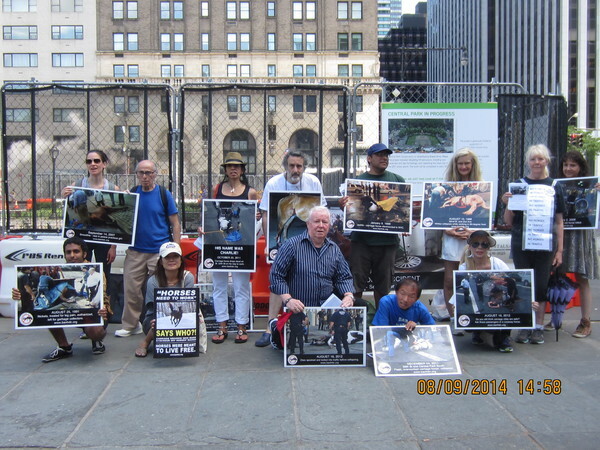 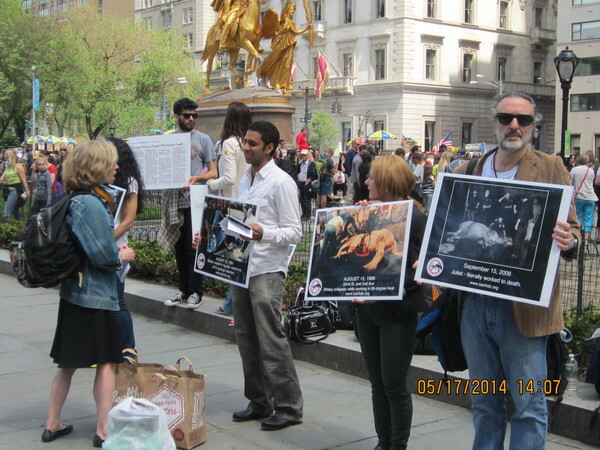 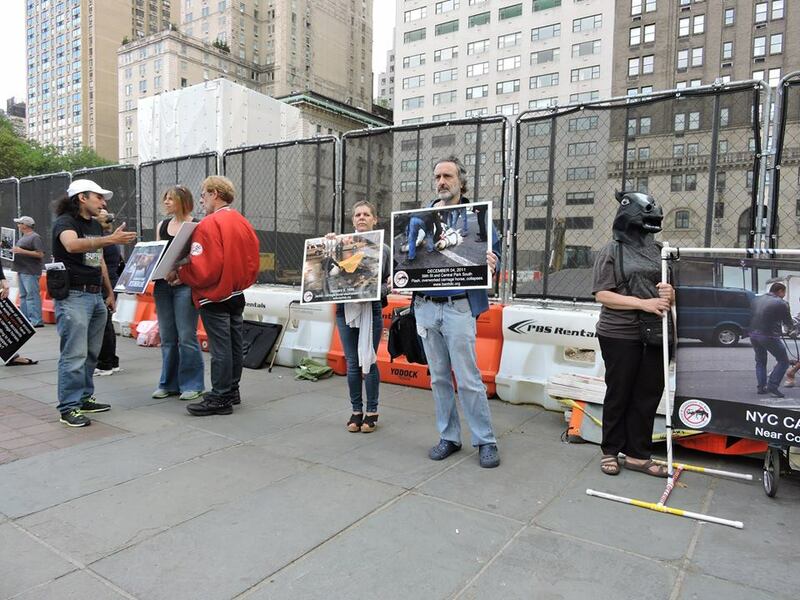 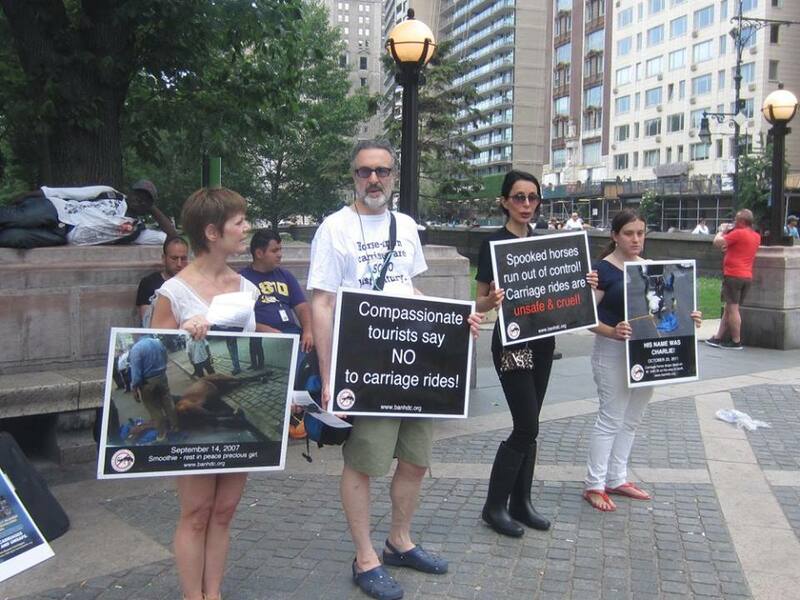 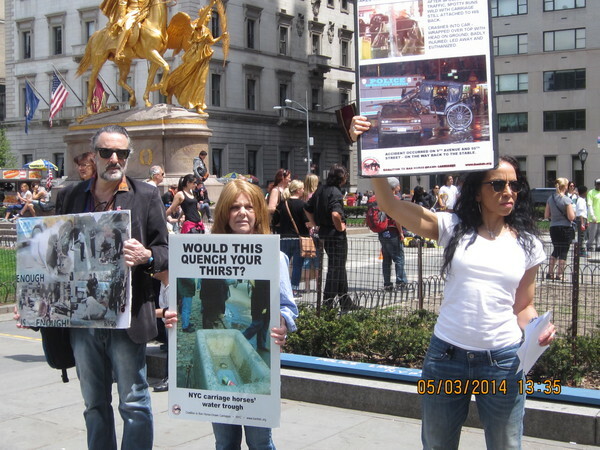 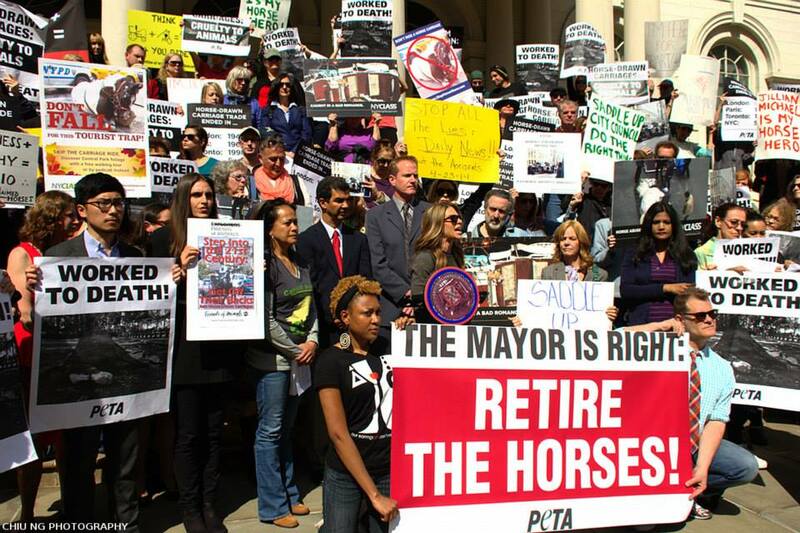 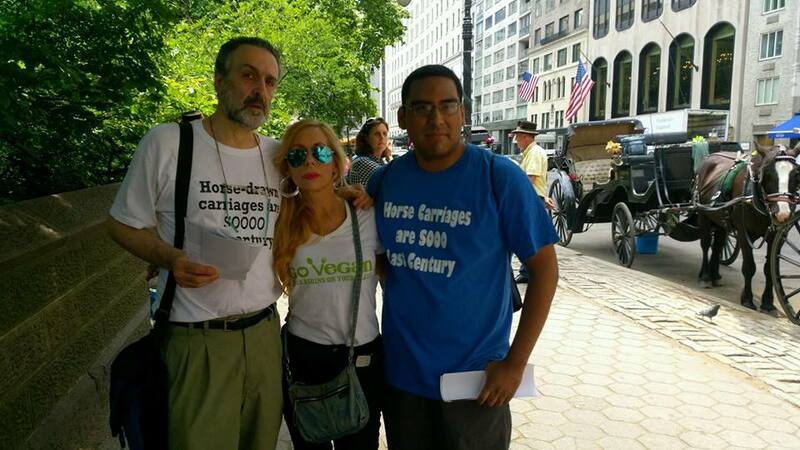 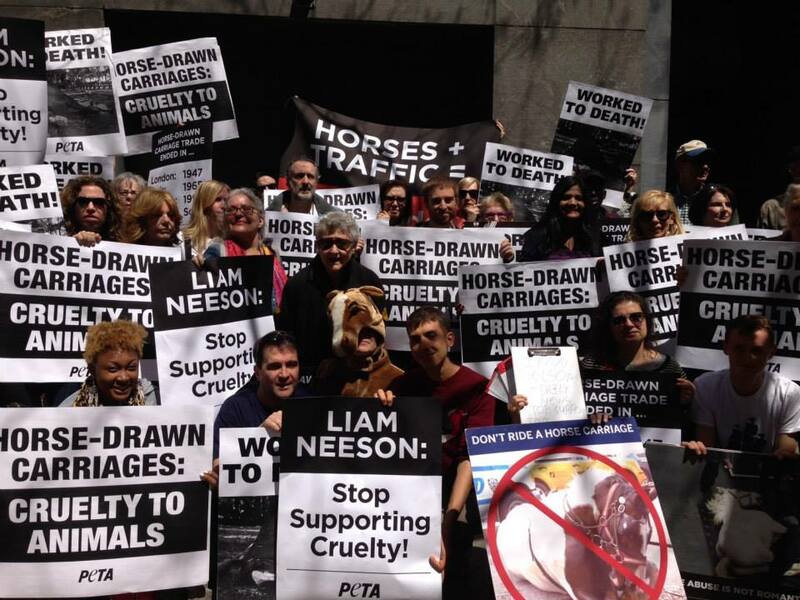 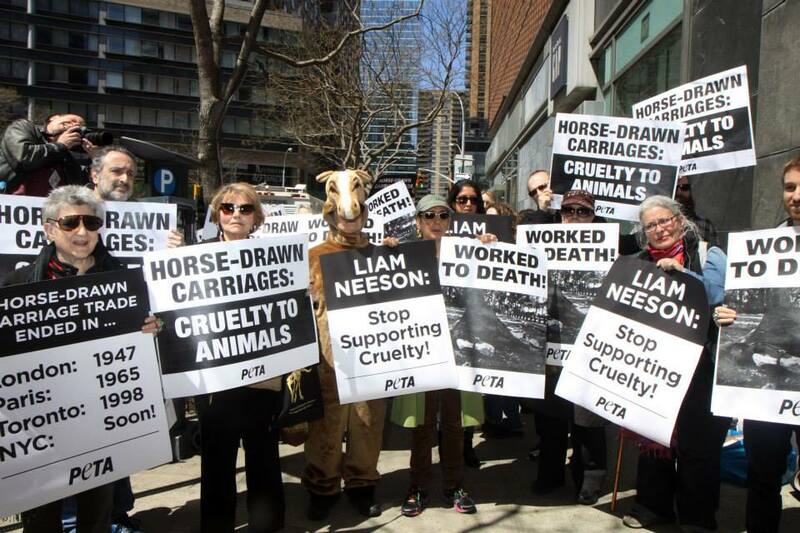 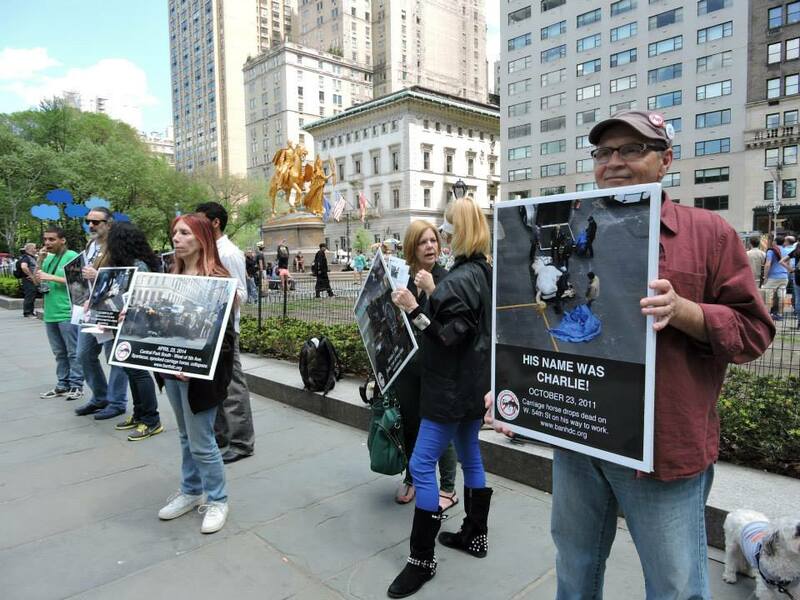 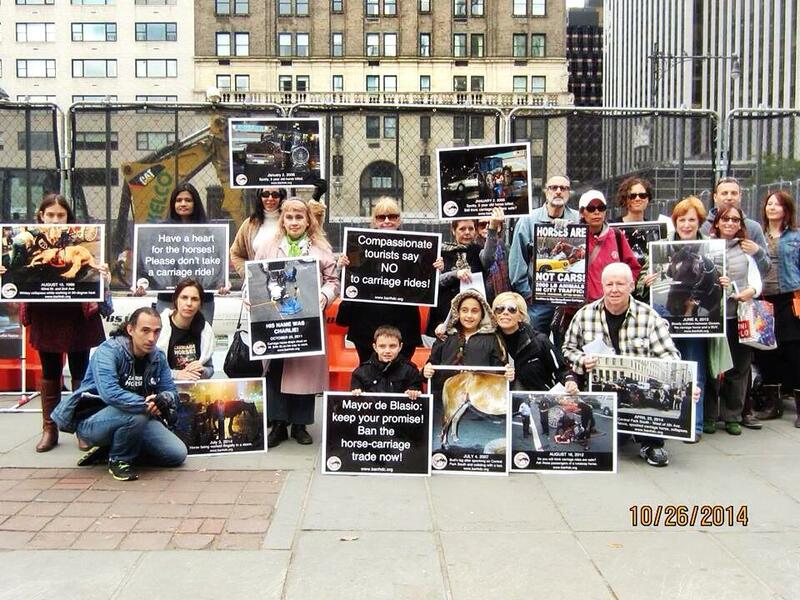 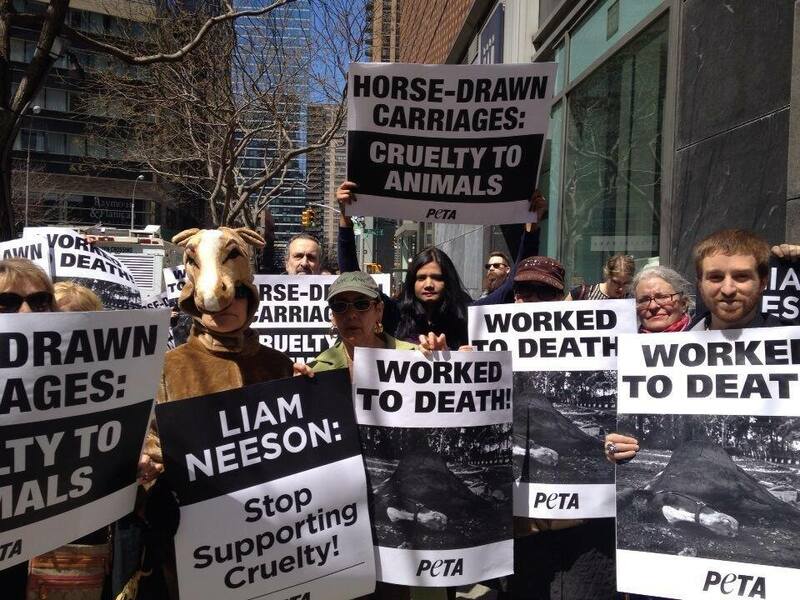 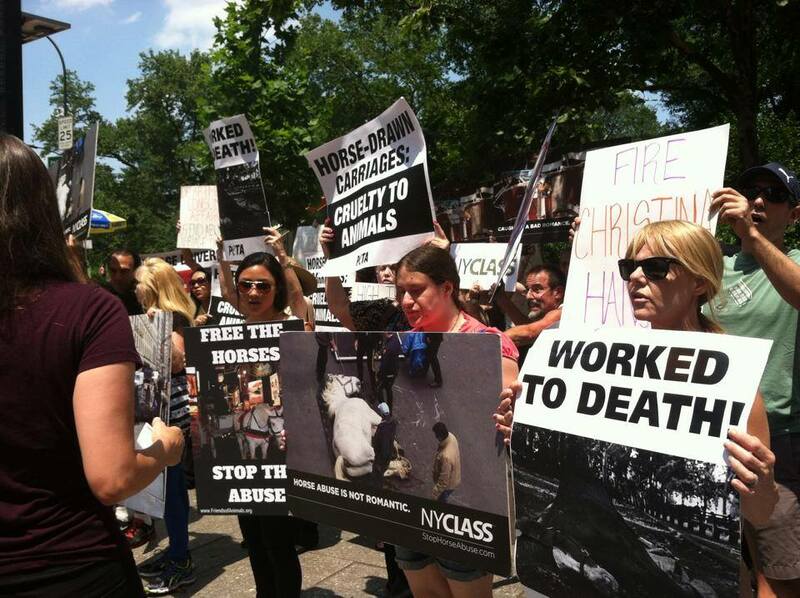 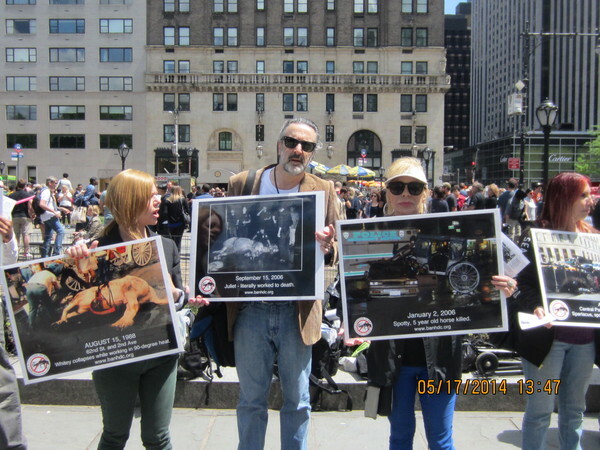 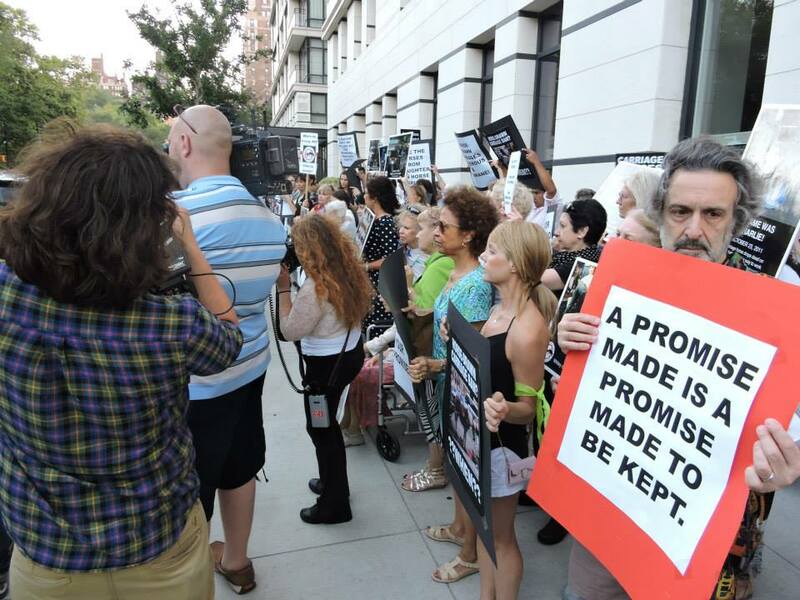 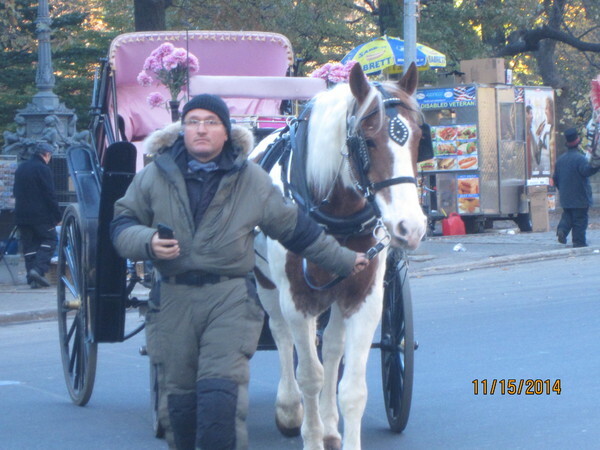 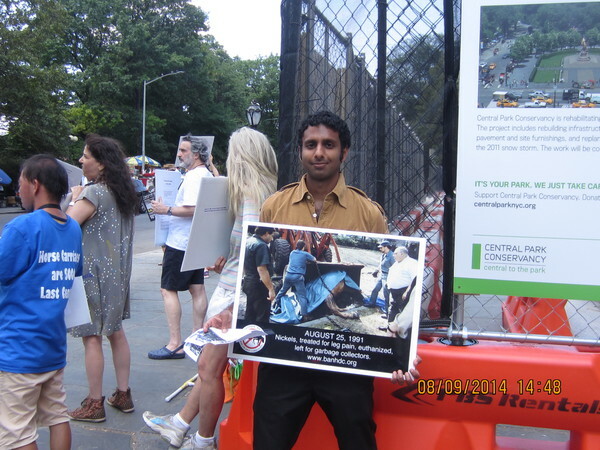 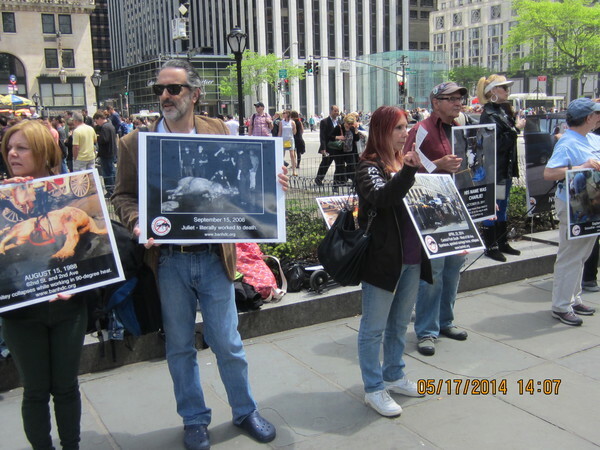 Click to see video: Vigil and protest in memory of Charlie the carriage horse who dropped dead on NYC streets 10/26/15. 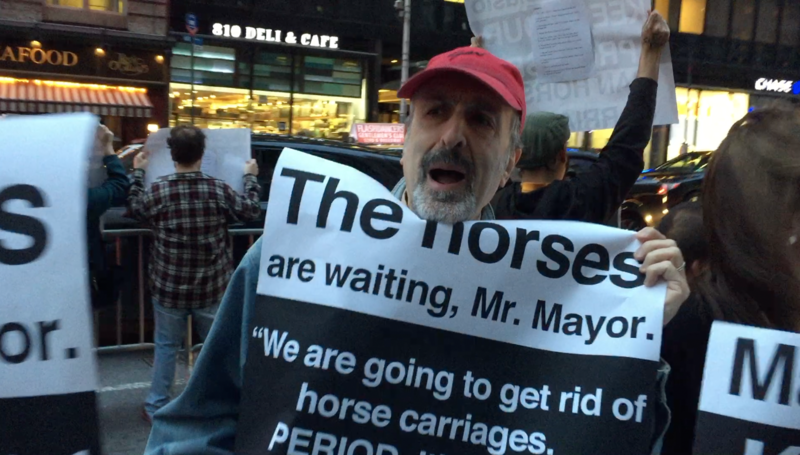 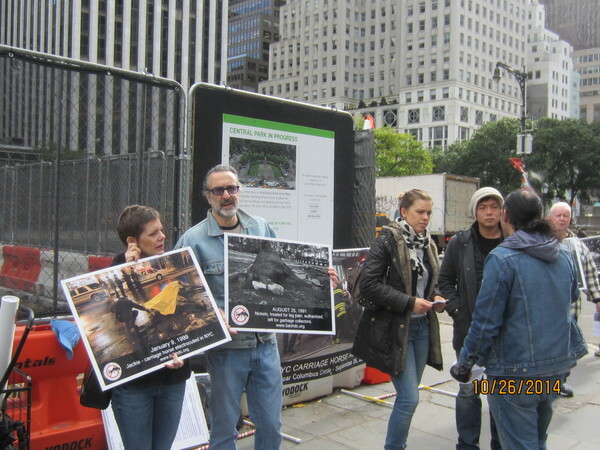 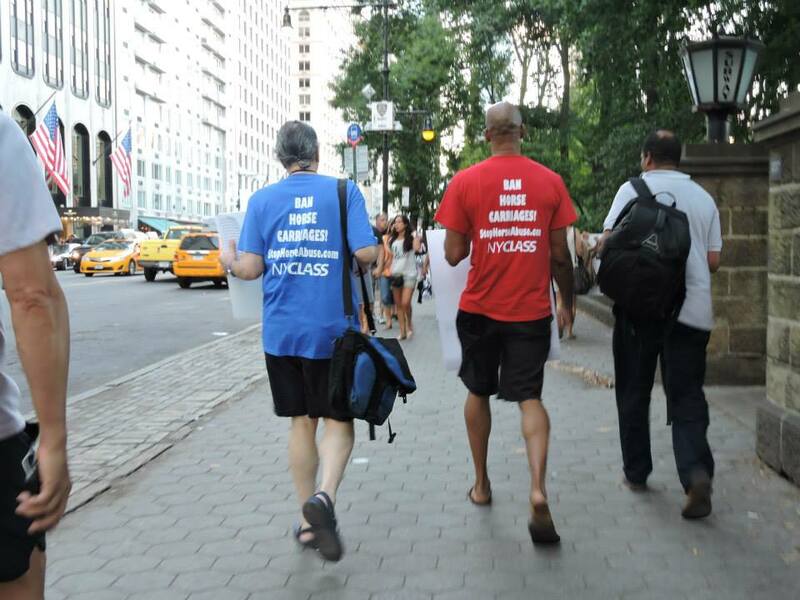 Protesting our mayor's not keeping his promise in front of the Sheraton Hotel on 53rd & 7th 10/29/15. 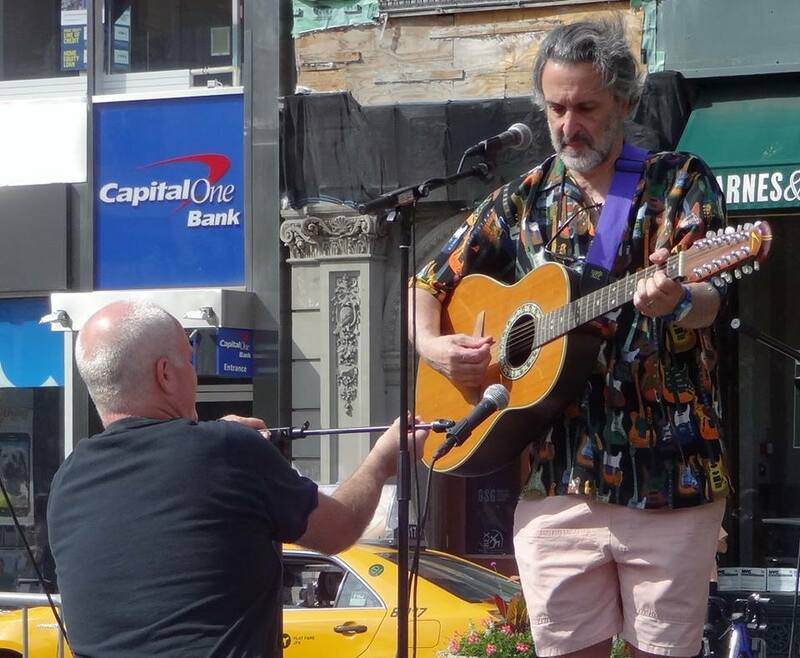 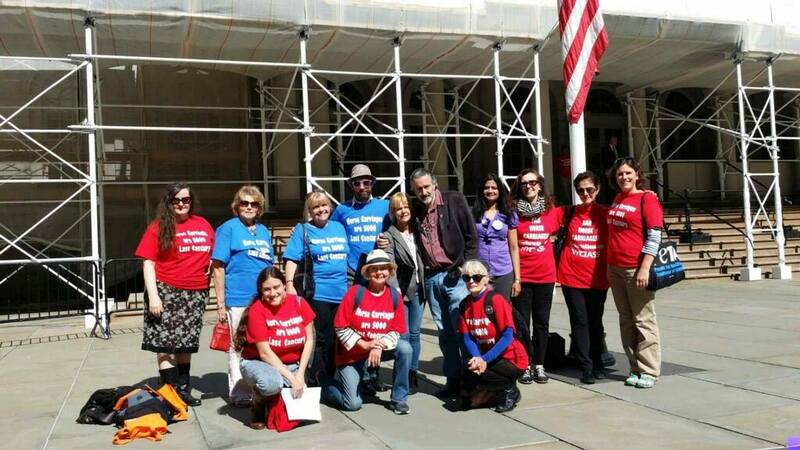 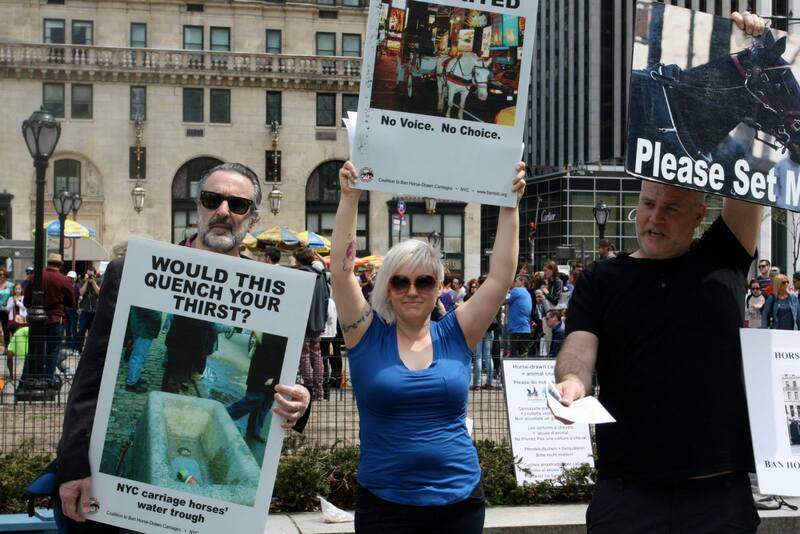 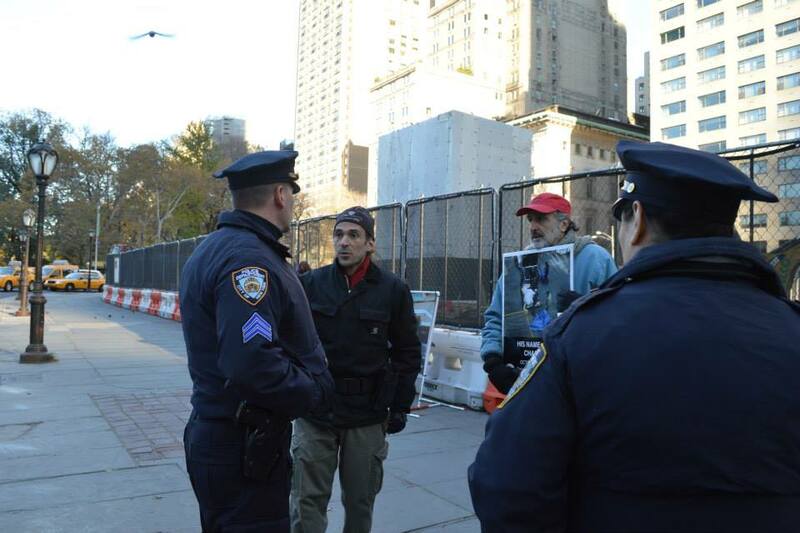 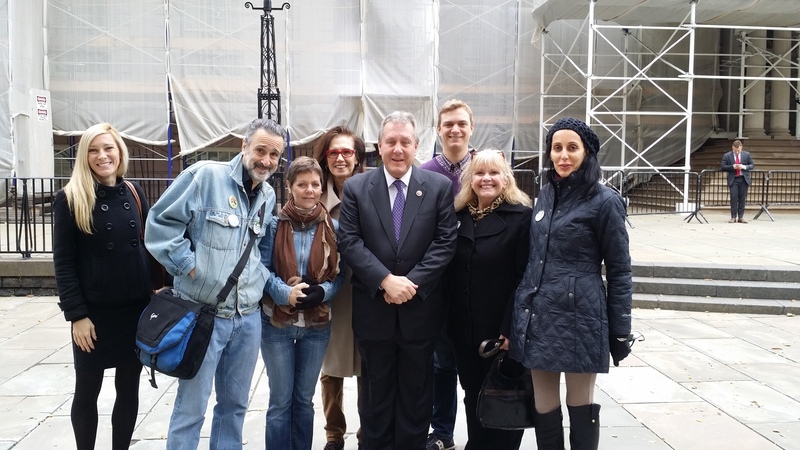 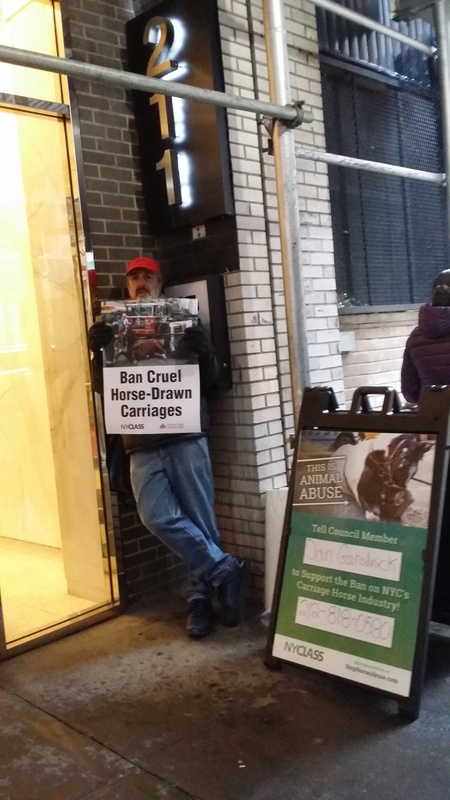 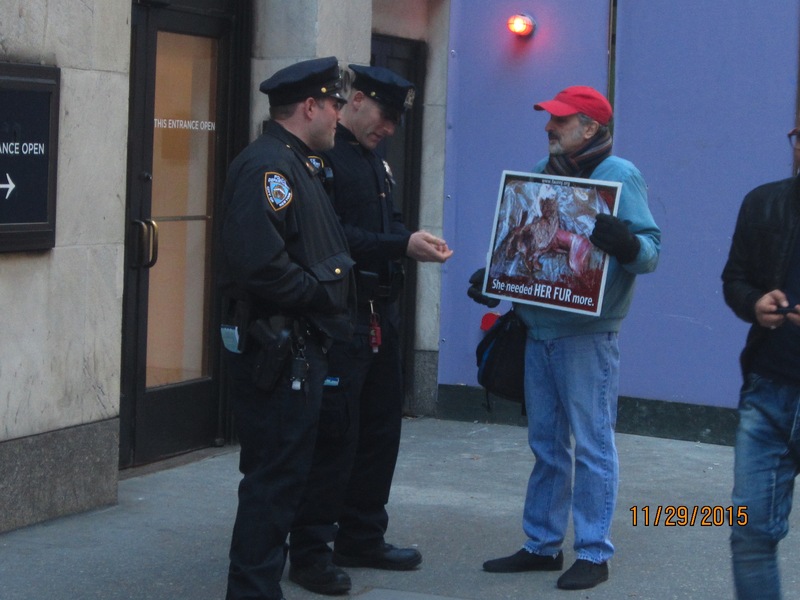 Click to see video: NY Blood Center protest at 110 East 42nd St 11/5/15. 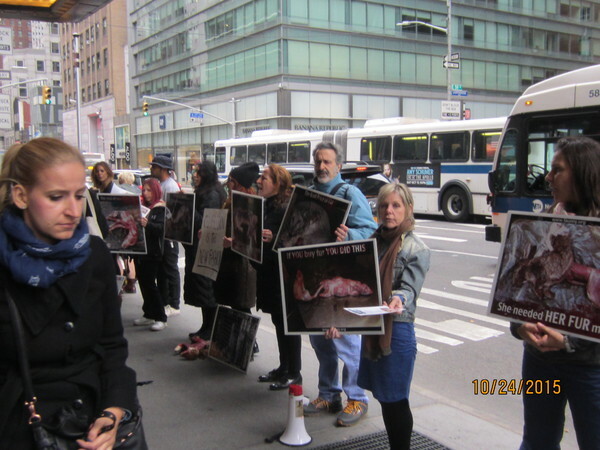 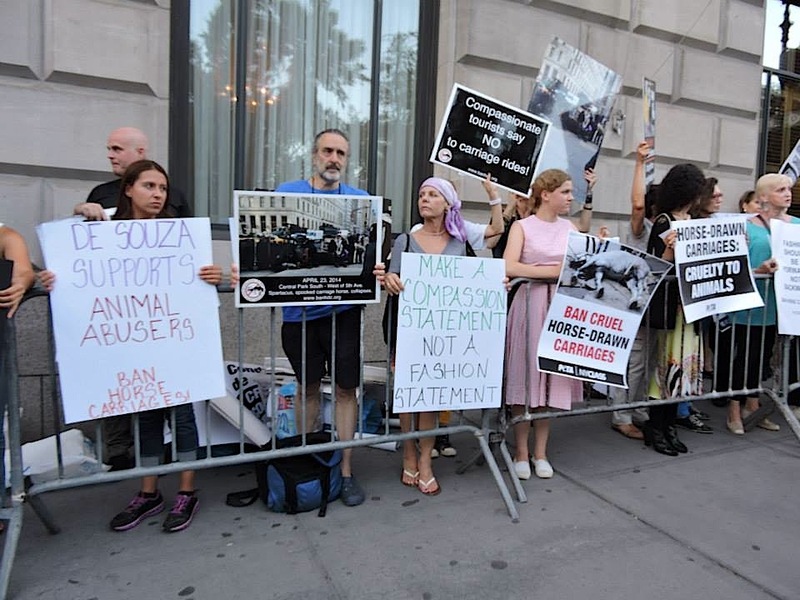 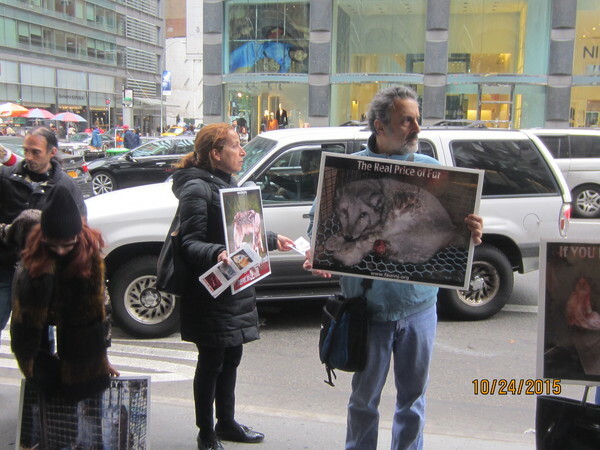 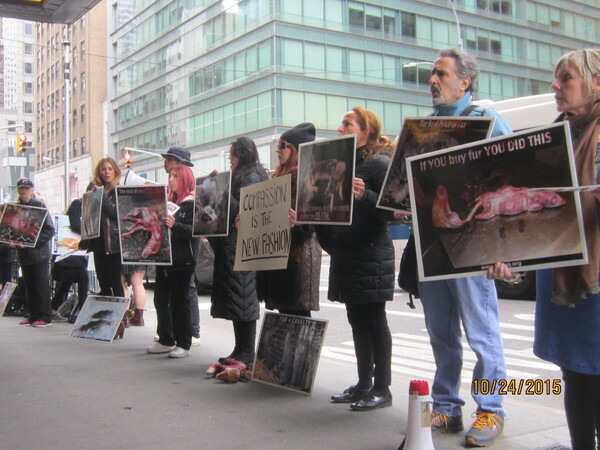 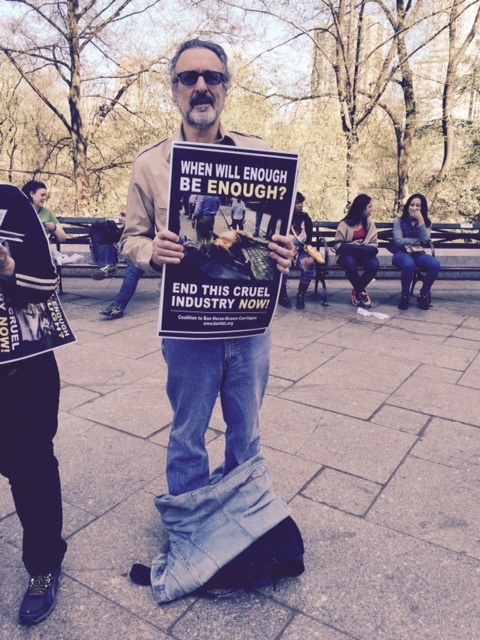 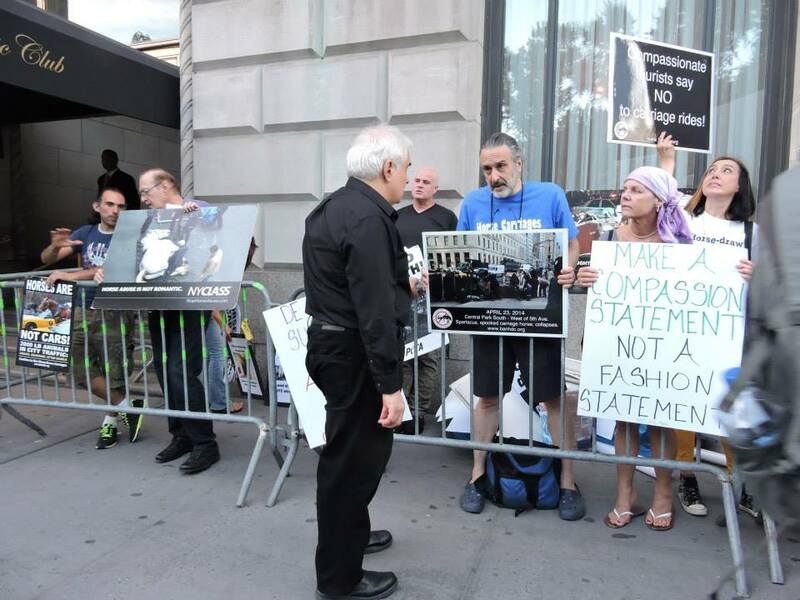 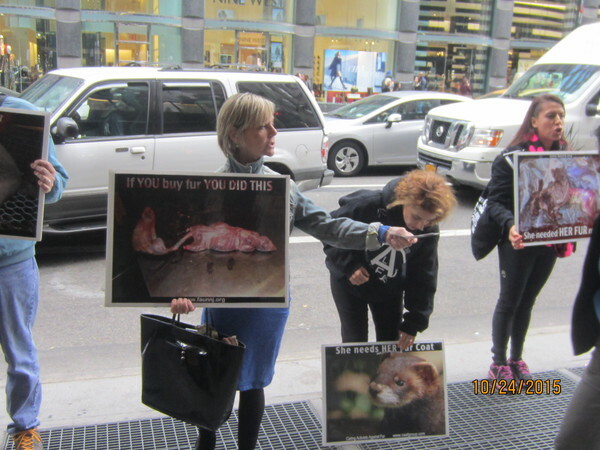 Click to see video: Anti-fur protest at The Fur Source 3 West 57th St 11/8/15. 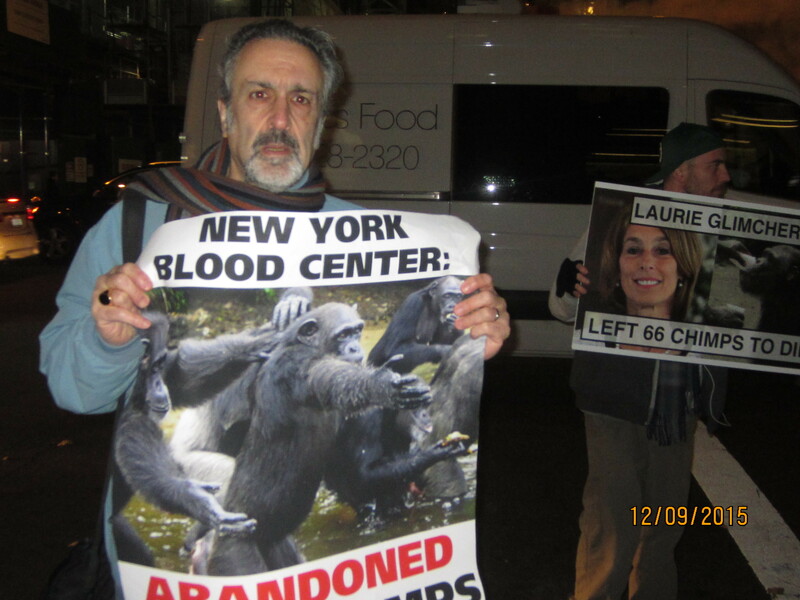 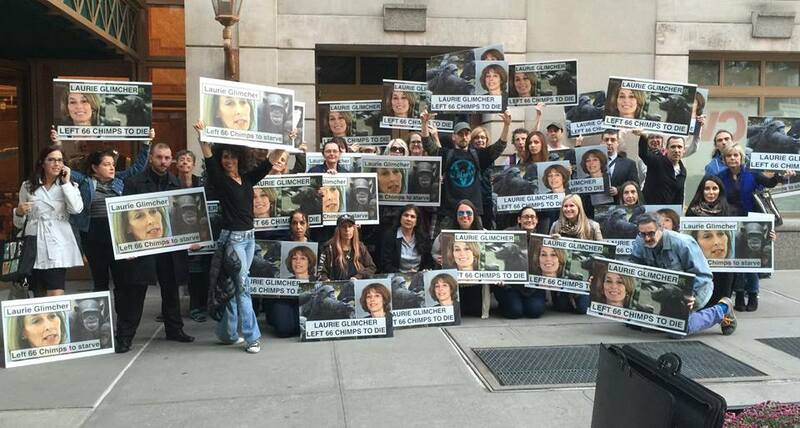 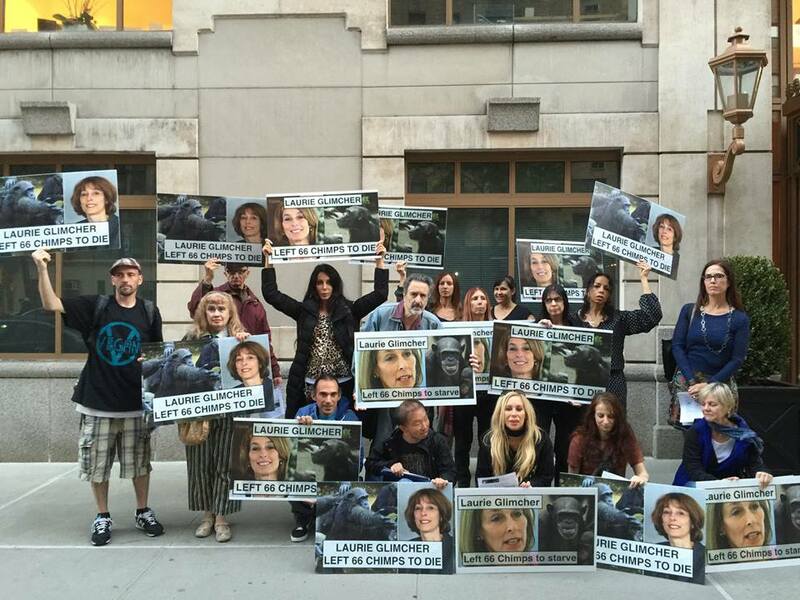 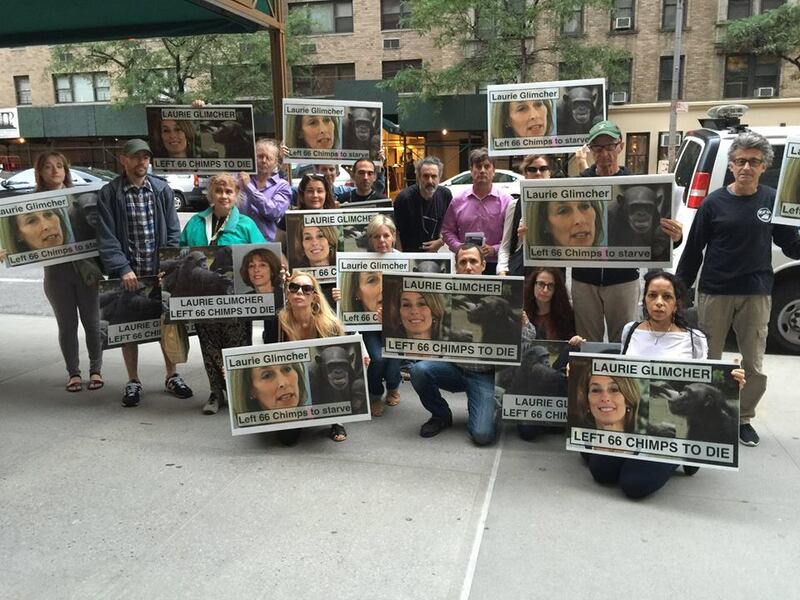 Click to see video from 11/16/15: Continuing efforts to shame Laurie Glimcher into taking responsibility for the abandoned chimps. 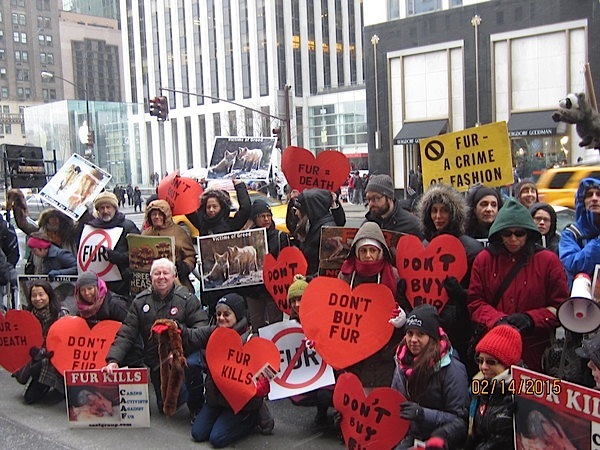 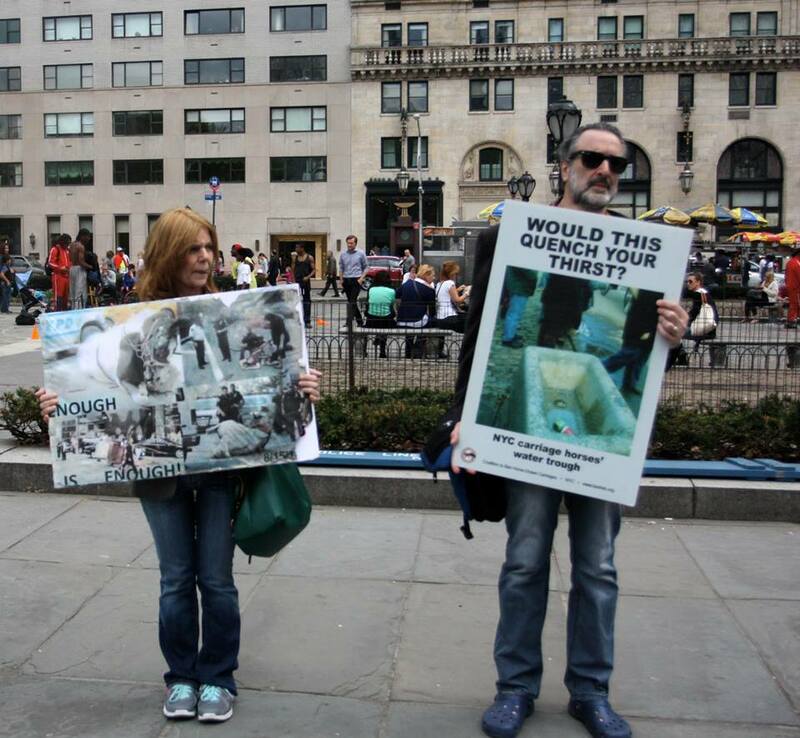 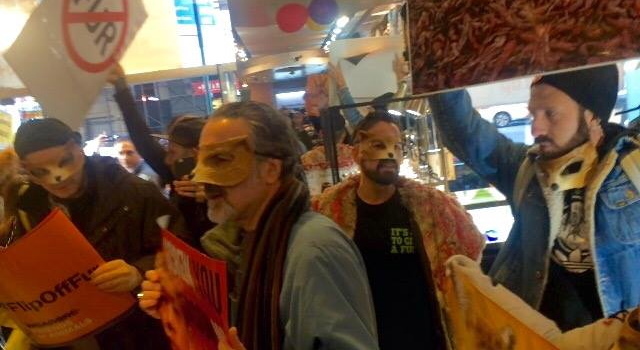 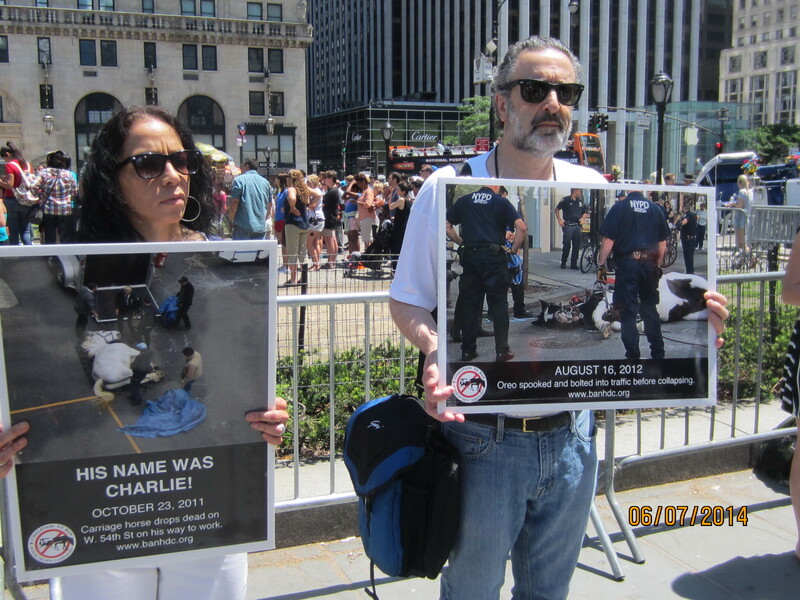 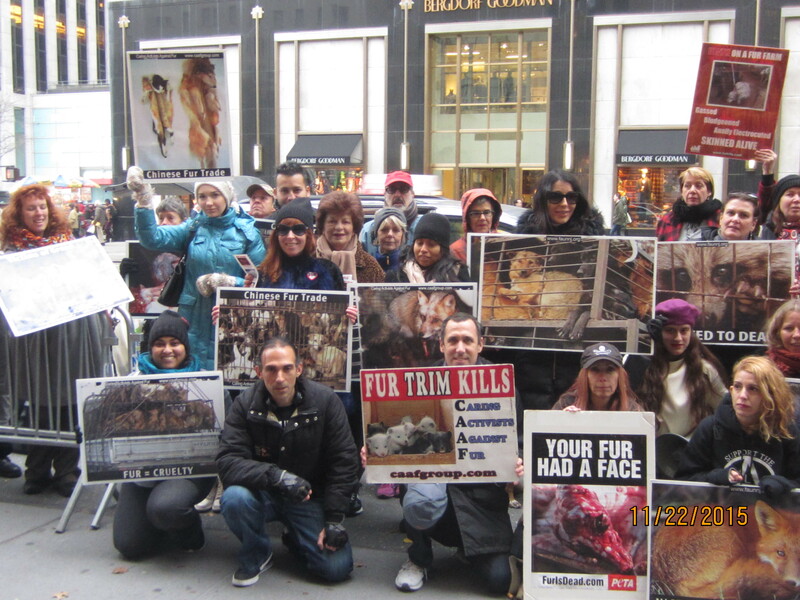 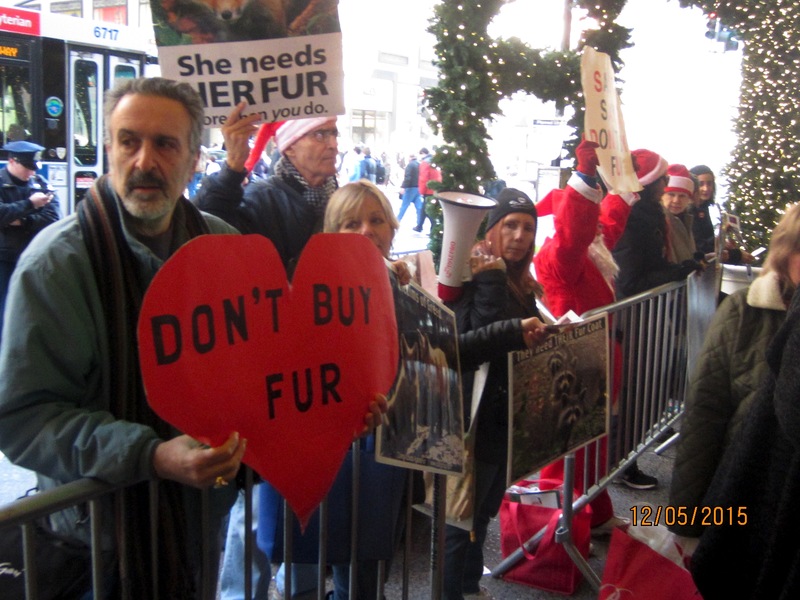 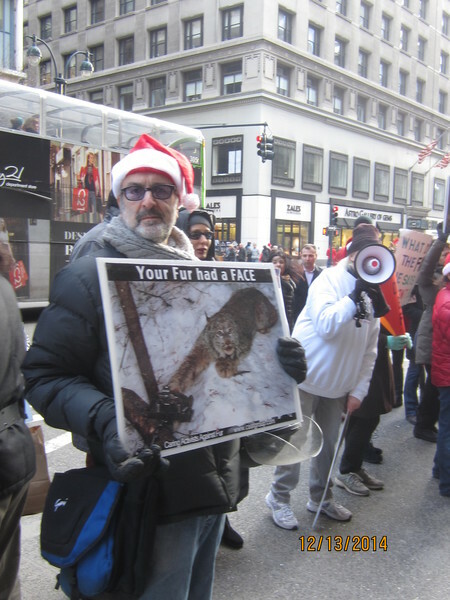 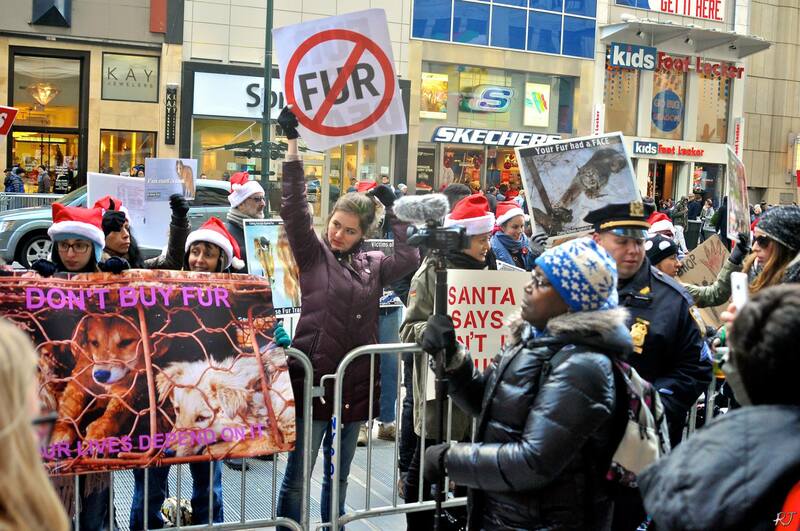 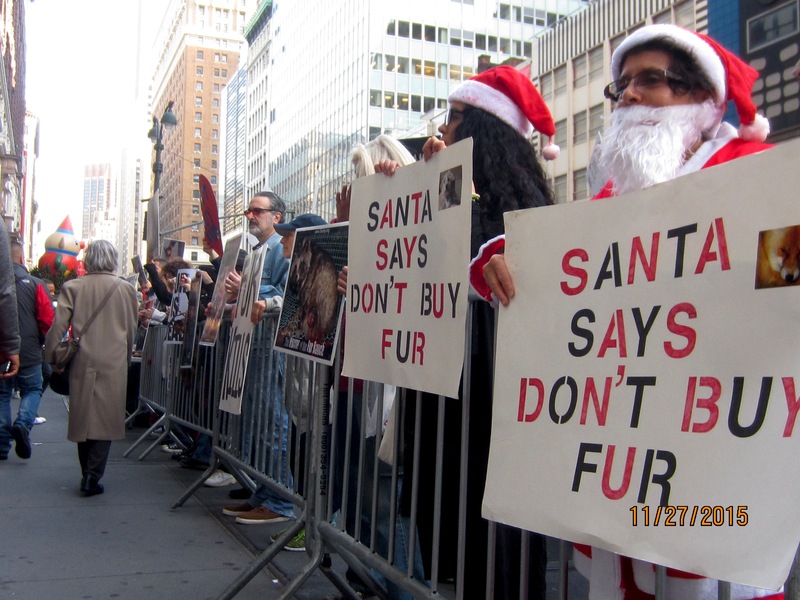 Click to see video: Anti-fur protest at Macy's Herald Sq 11/27/15. 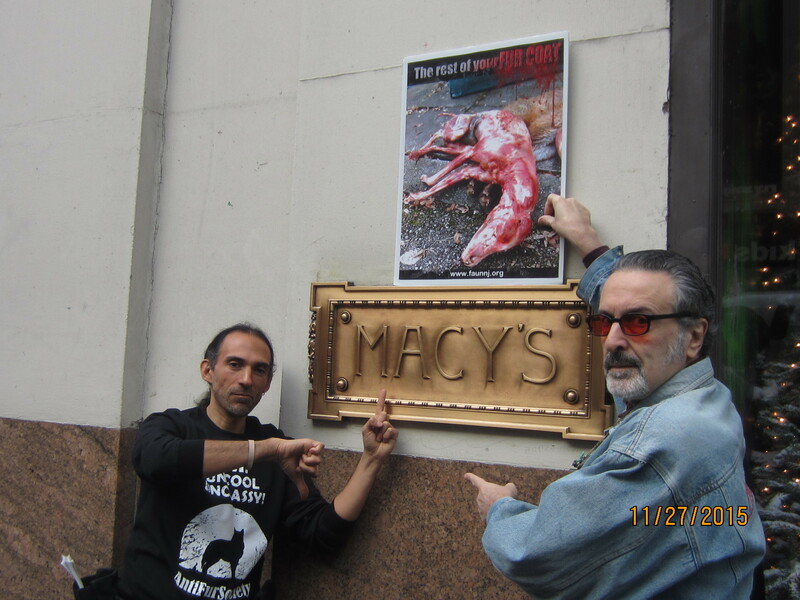 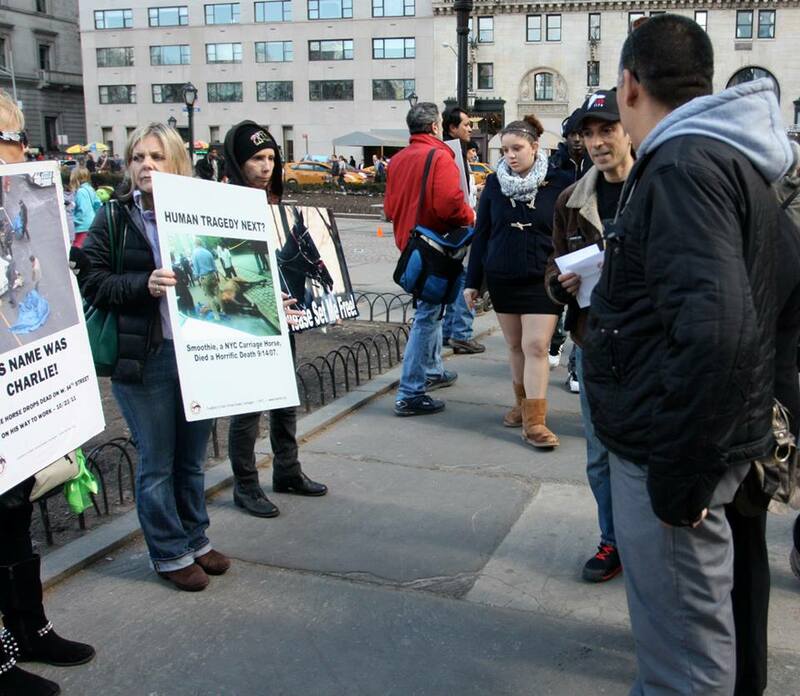 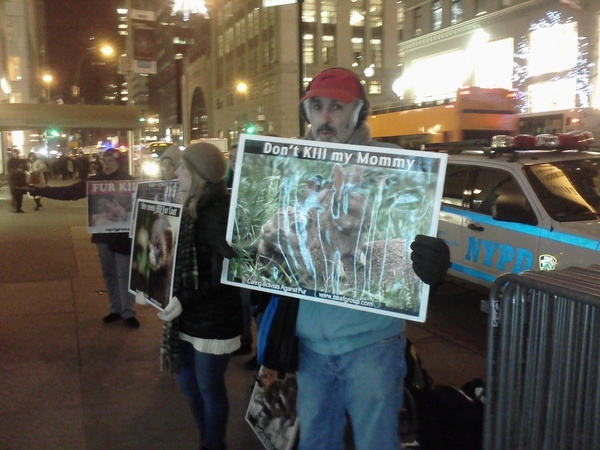 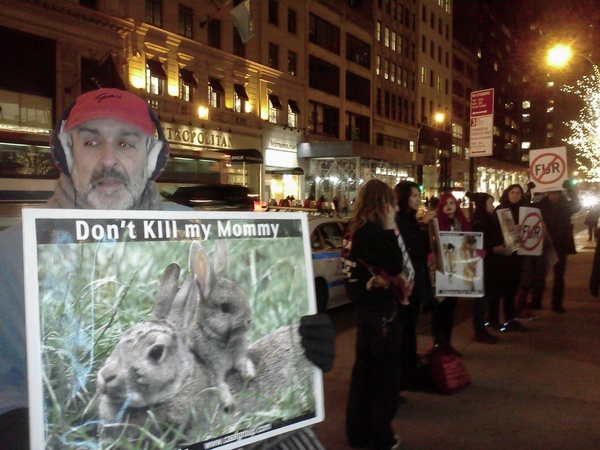 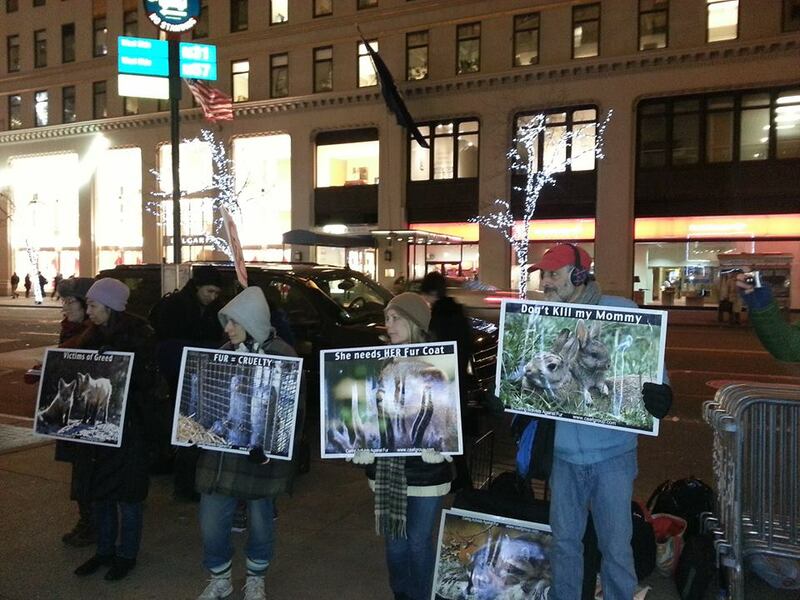 Click to see another video: Anti-fur protest at Macy's Herald Sq 11/27/15. 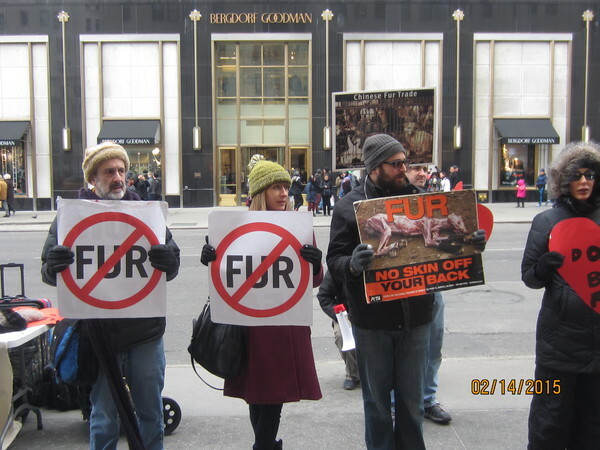 Anti-fur protest at The Fur Source 3 West 57th St 11/29/15. 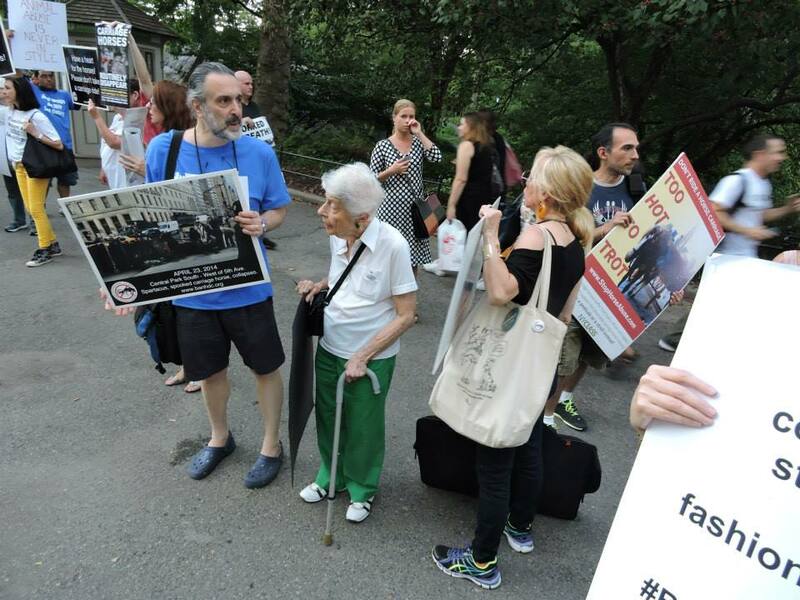 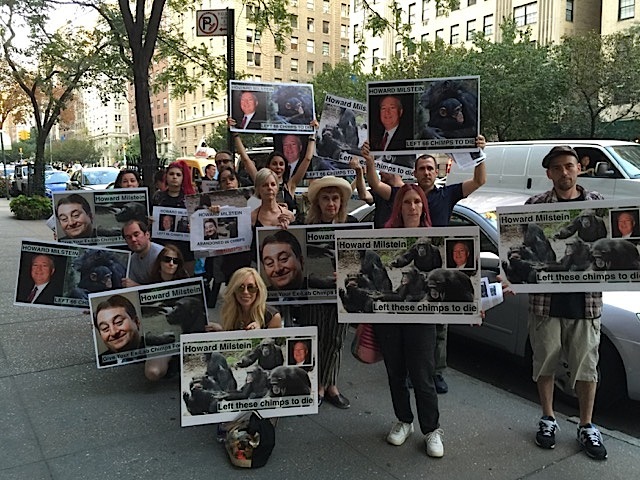 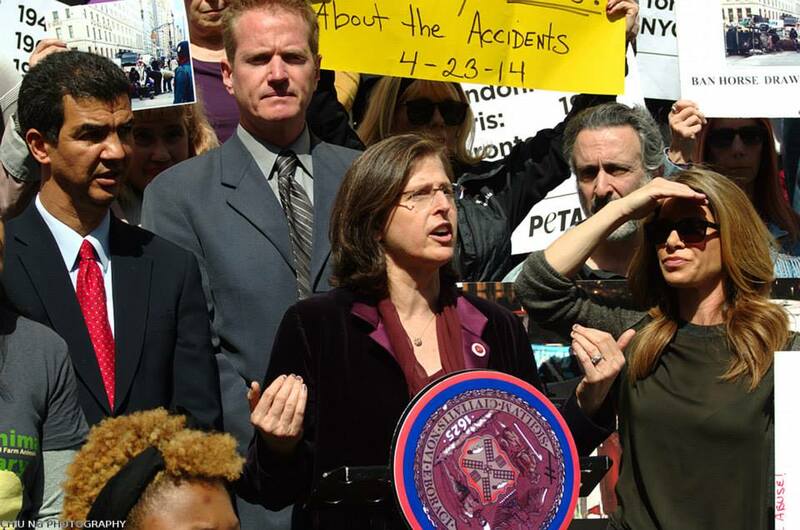 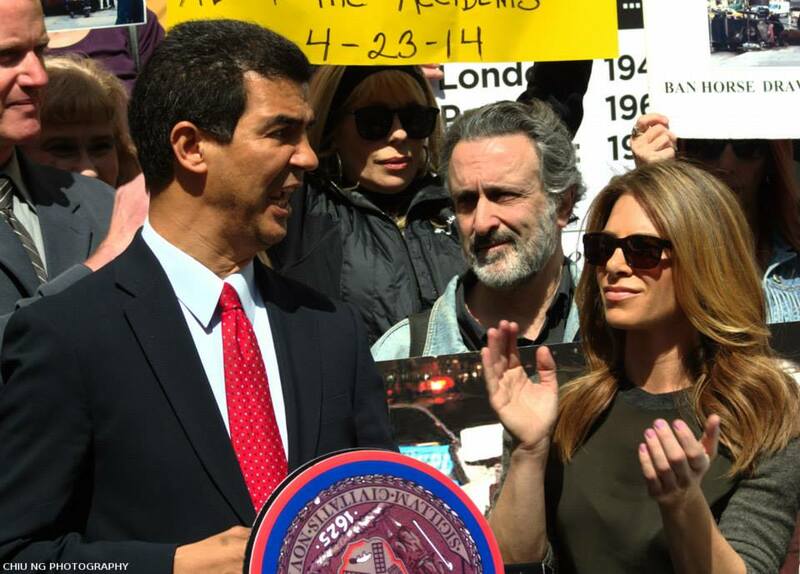 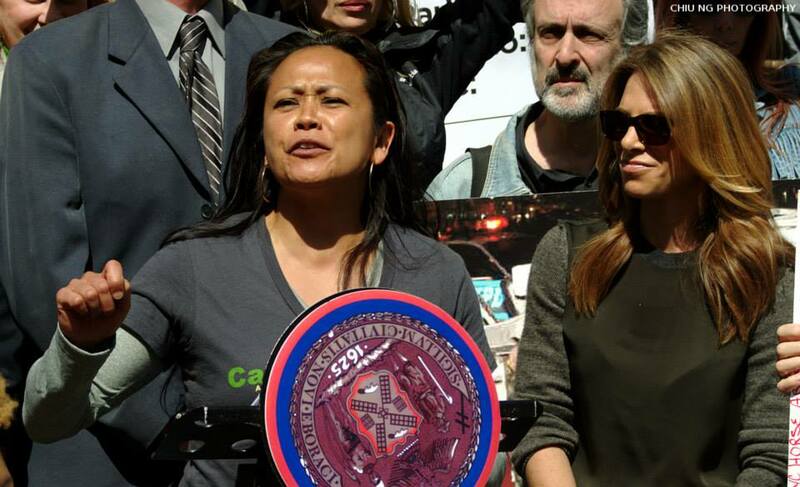 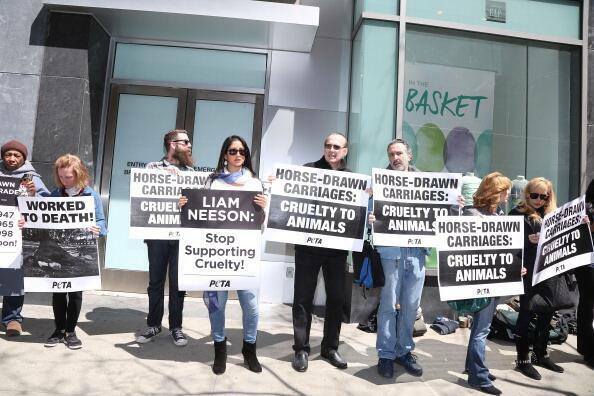 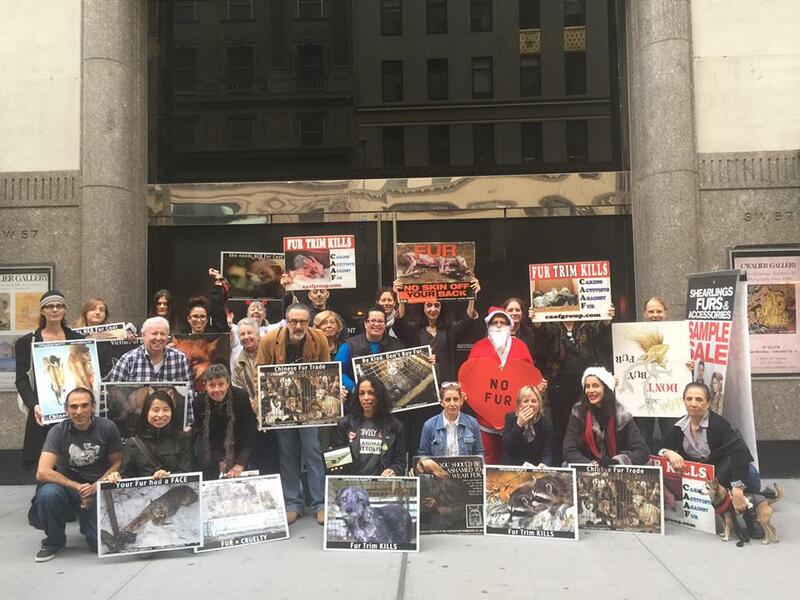 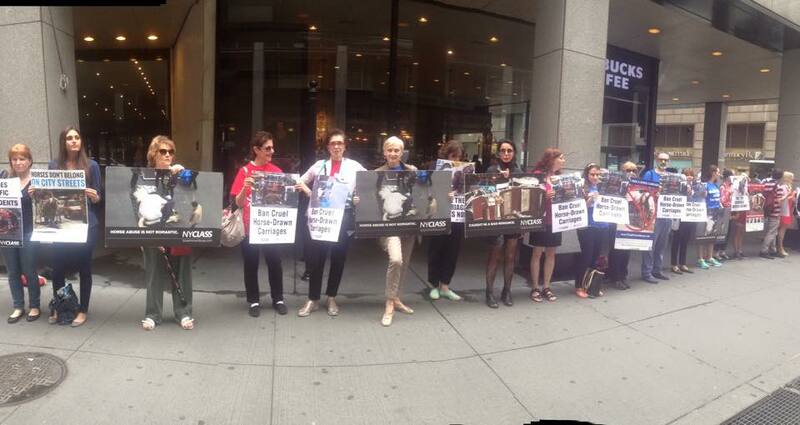 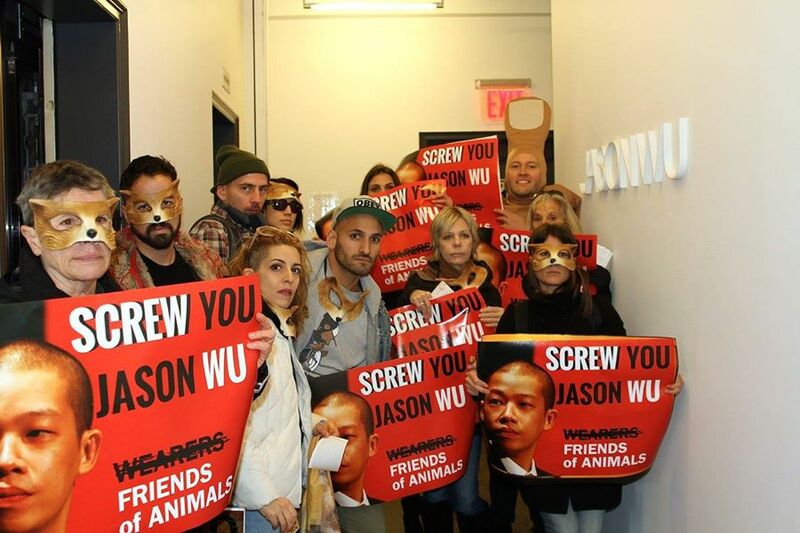 Anti-fur protest at fashion designer Jason Wu's office & a fur store on 7th Avenue 12/5/15. 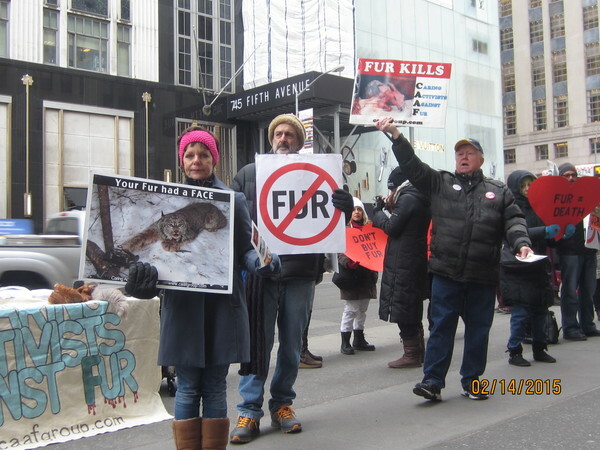 Anti-fur protest at Lord & Taylor 12/5/15. 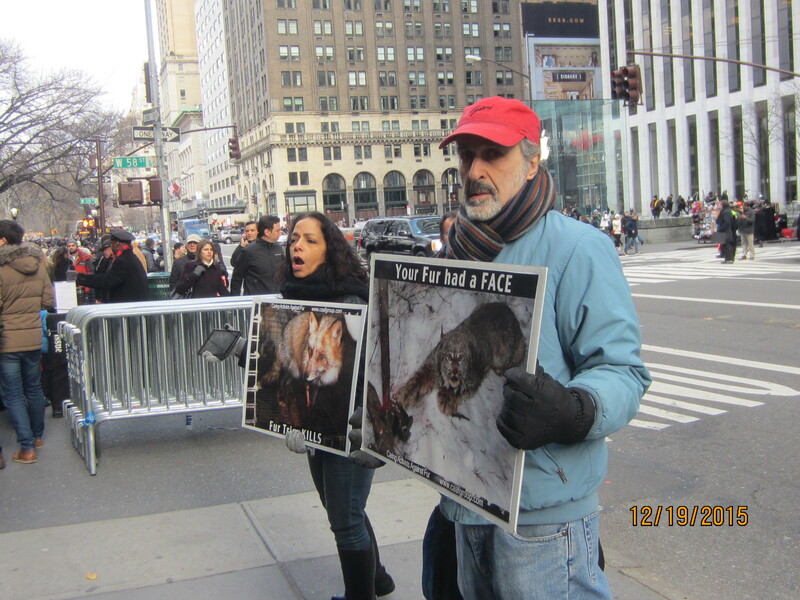 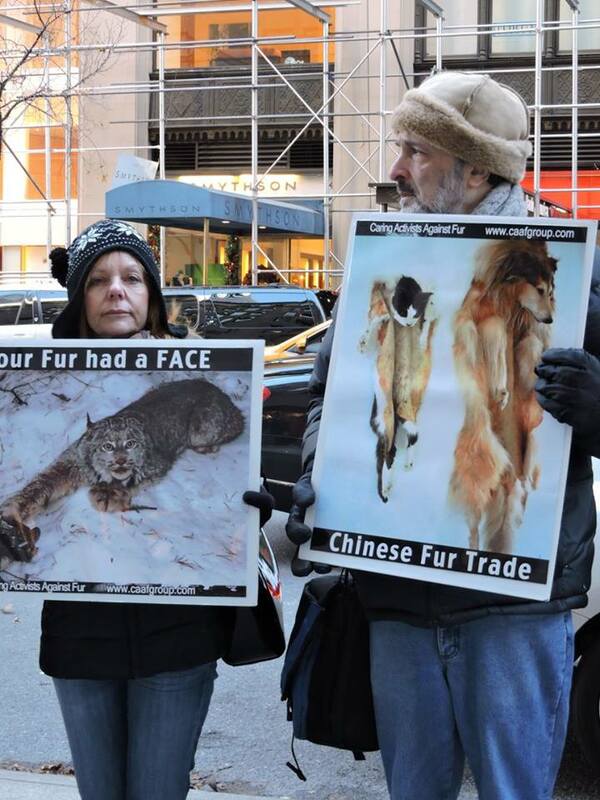 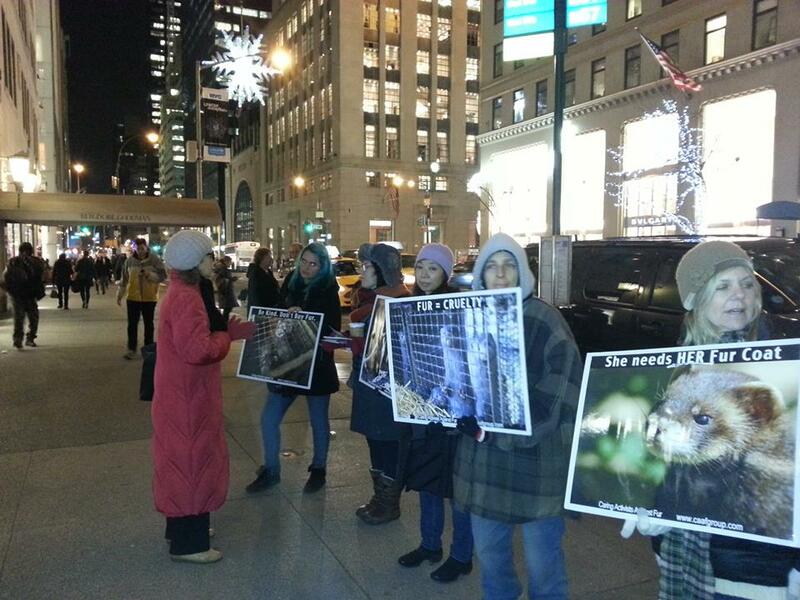 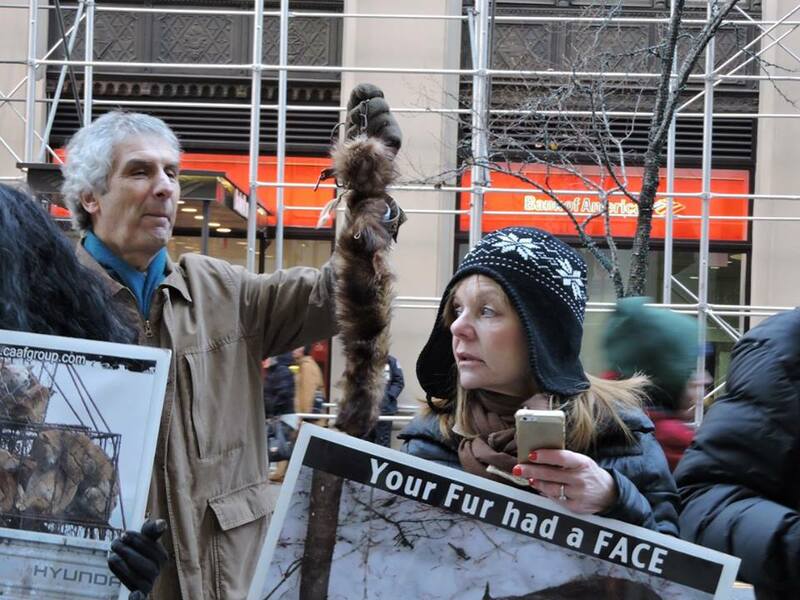 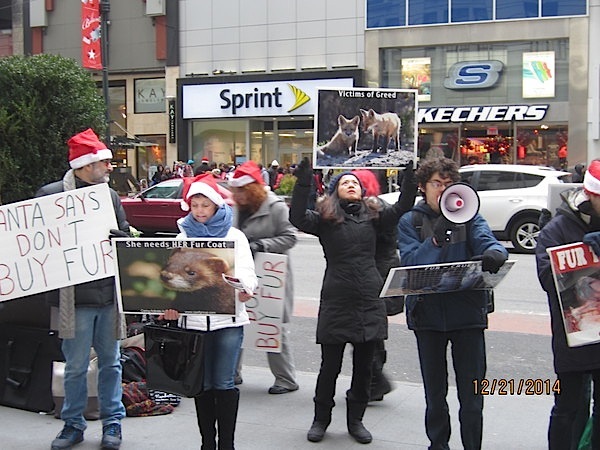 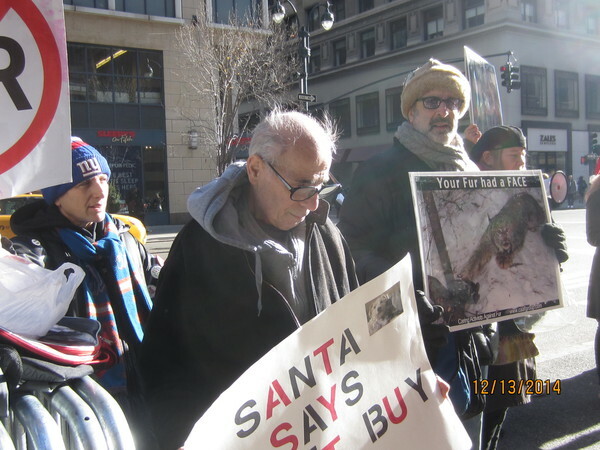 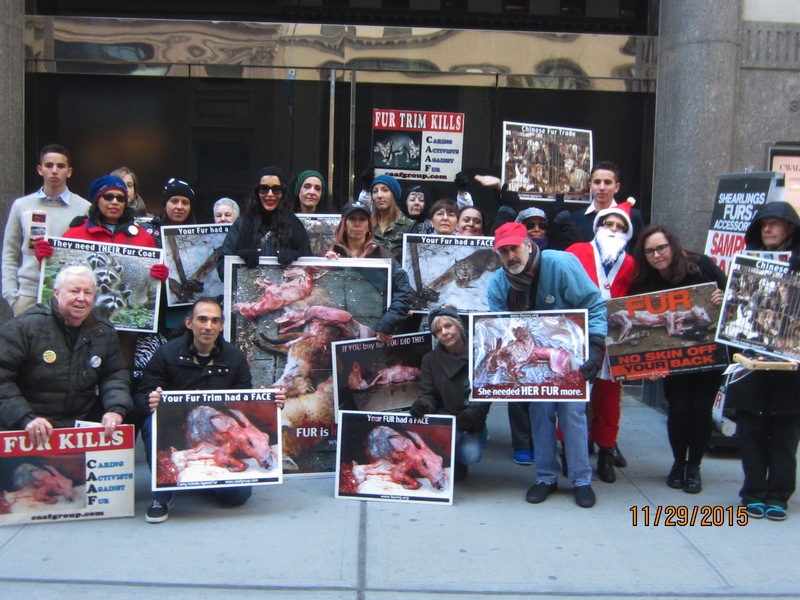 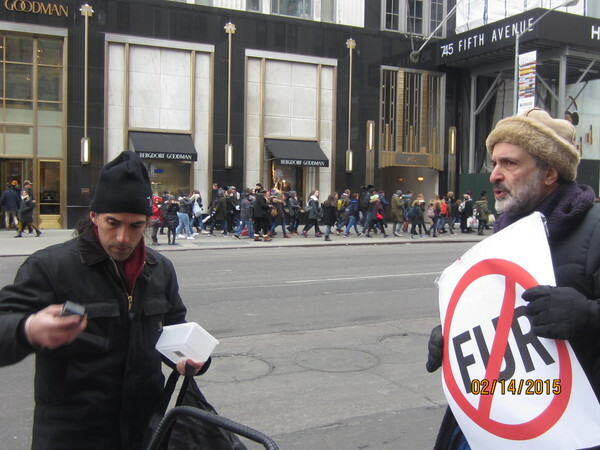 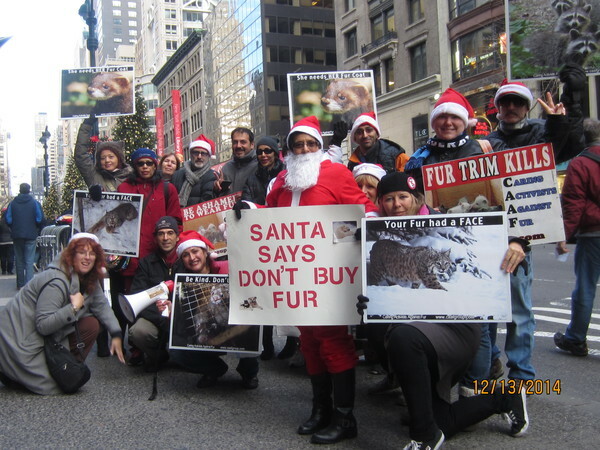 Click to see video: Anti-fur protest at The Fur Source 3 West 57th St 12/13/15. 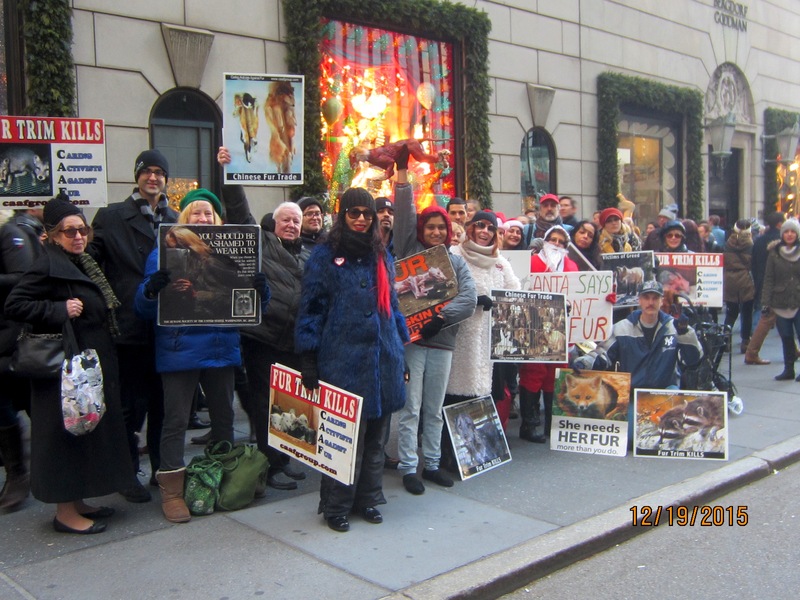 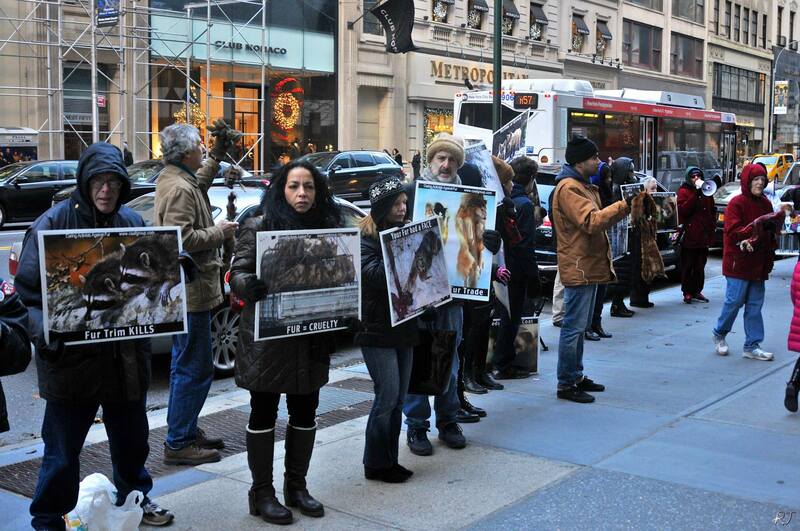 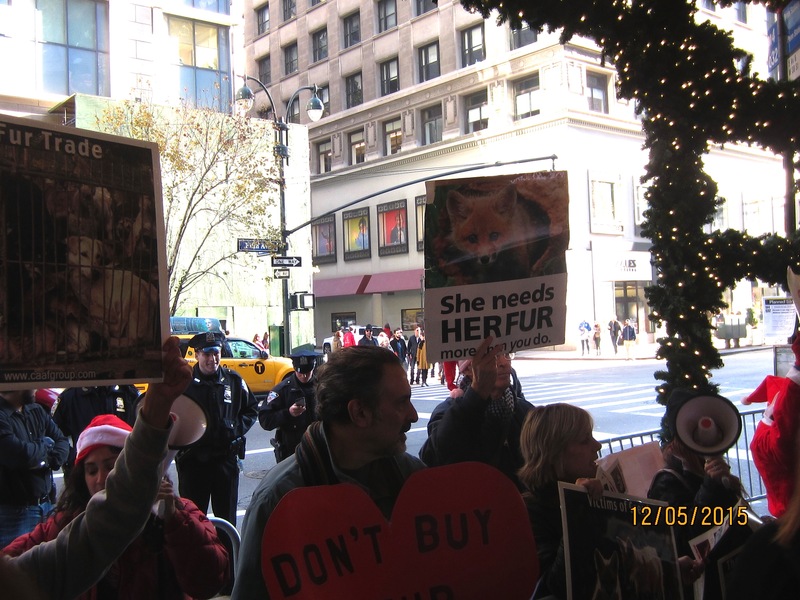 Anti-fur protest at Bergdorf Goodman 12/19/15.